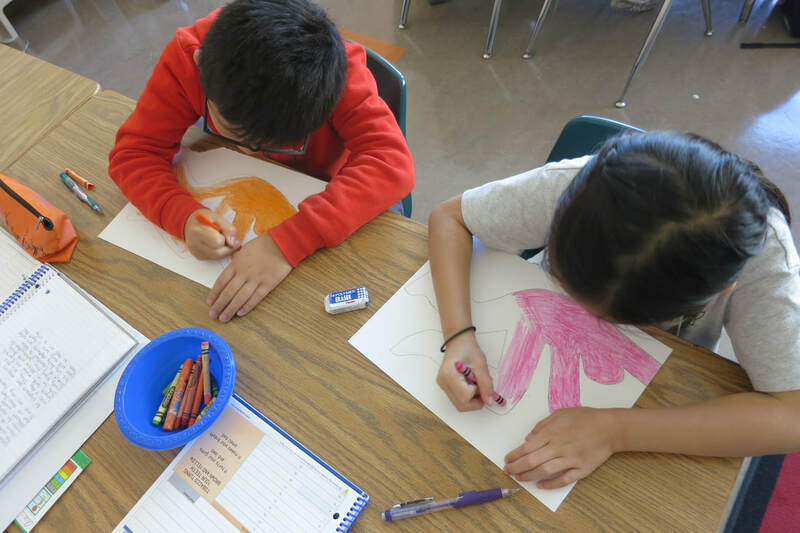 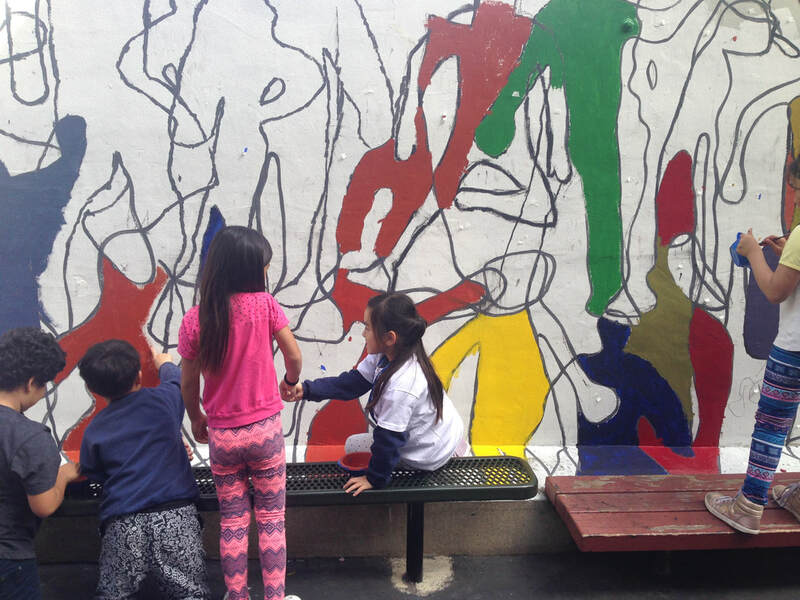 Fall is starting with a new project, a large scale mural at John Yehall Chin Elementary, in the heart of North Beach in San Francisco. 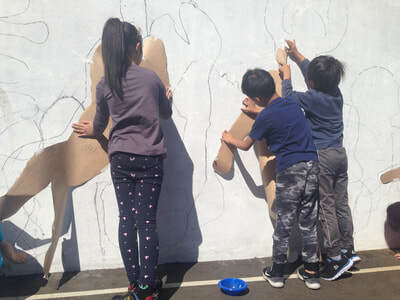 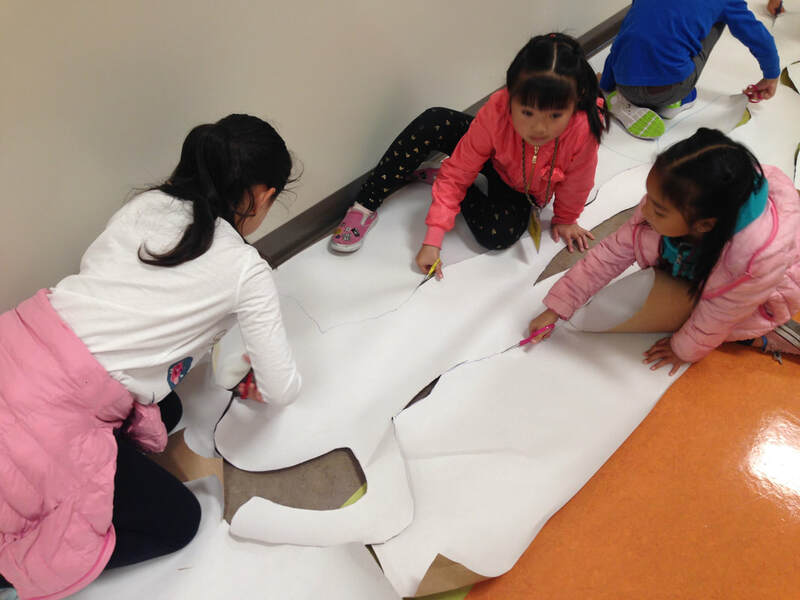 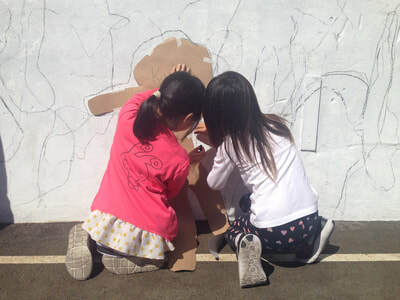 Part of the process of creating the mural was orchestrating the collaboration with the entire school, almost 300 K-5 students, director and teachers. 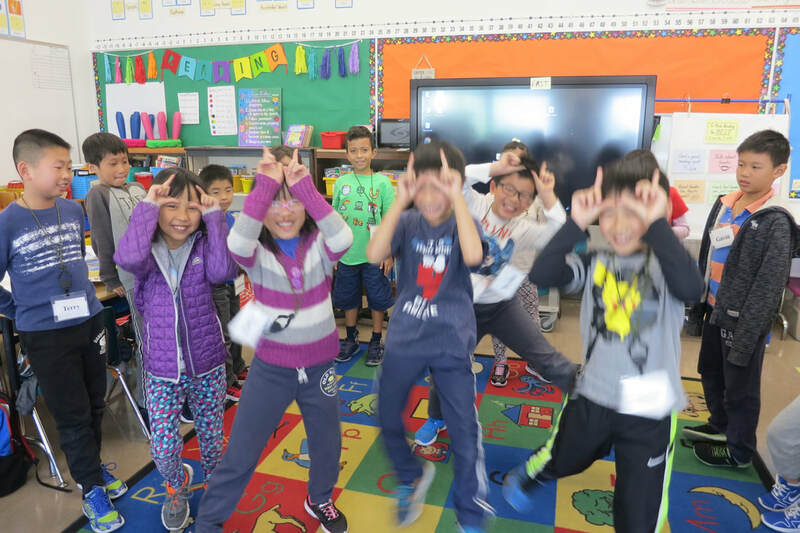 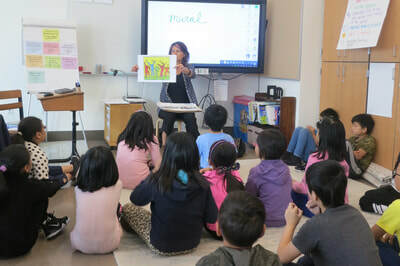 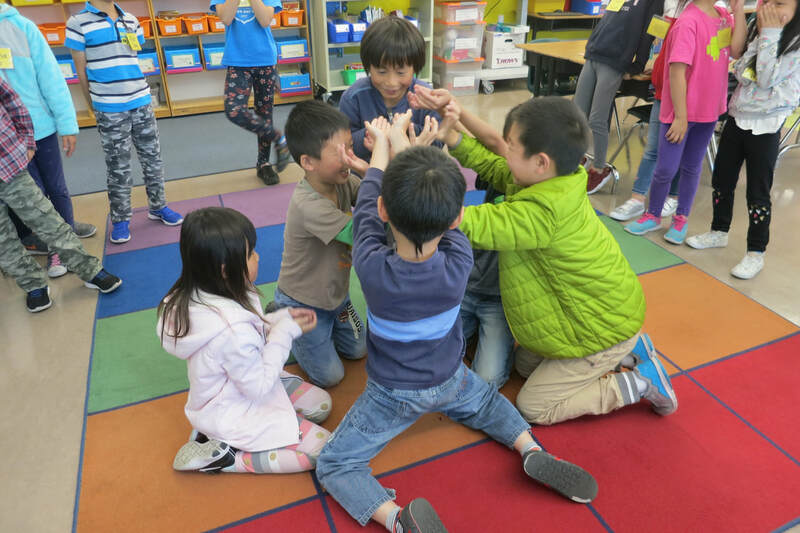 Incorporating the school’s mission, based in Coach Woods Pyramid of Success, I prepared a series of games and exercises for the kids to learn how to use their bodies to express some of the values featured in the pyramid, like friendship, enthusiasm, collaboration, etc. 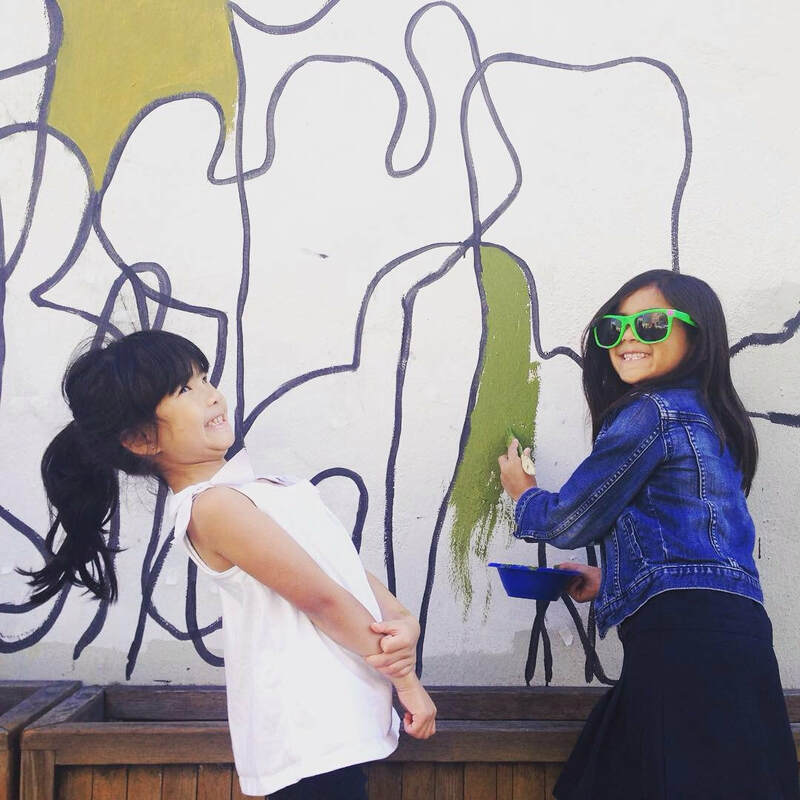 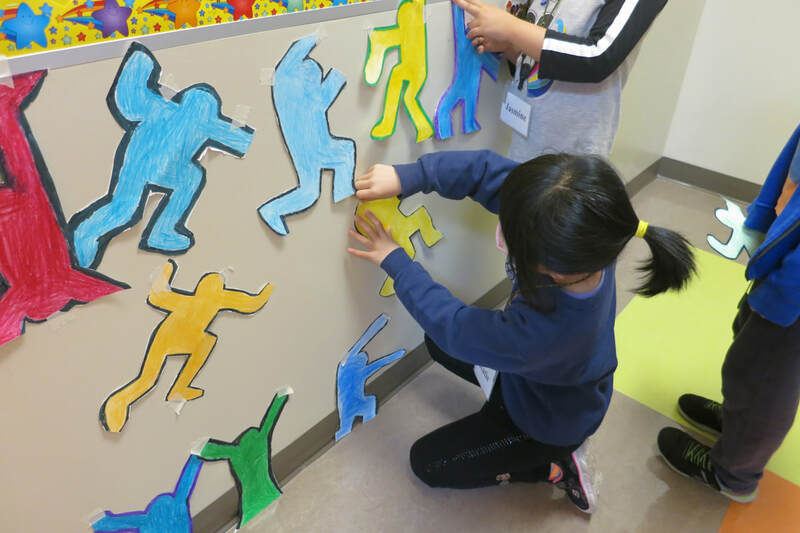 I also introduced the kids to artist Keith Haring's work, street art and traditional mural painting techniques. 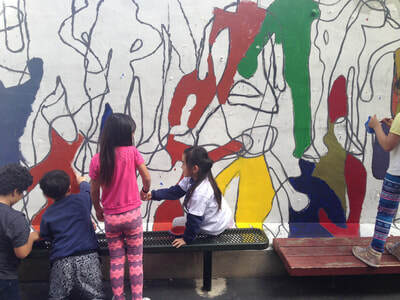 The final mural consisted of the students bodies outlines transferred onto the wall, creating an intricate web of bodies. The lines and colors emphasized our personal and shared emotions and values. 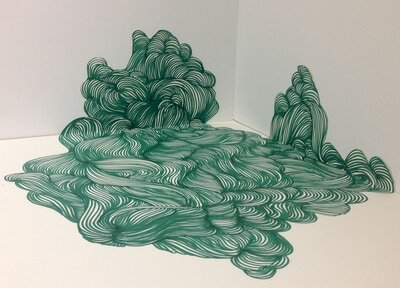 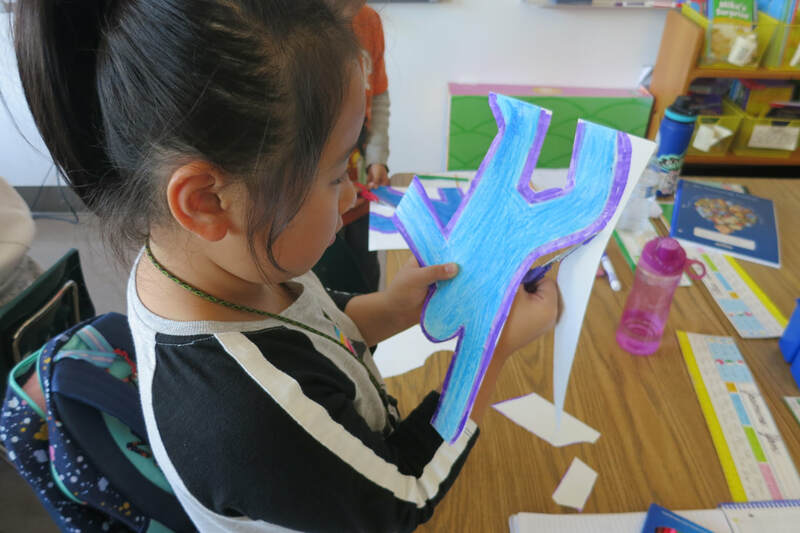 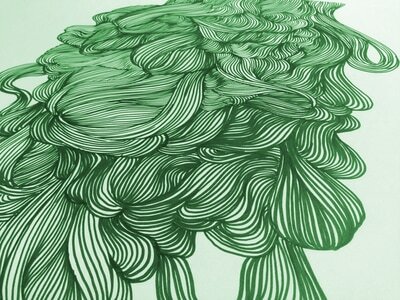 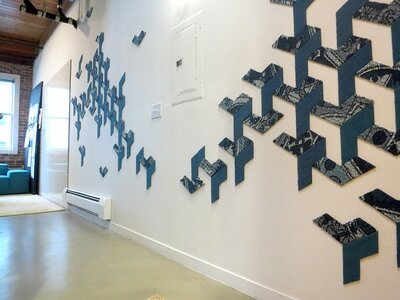 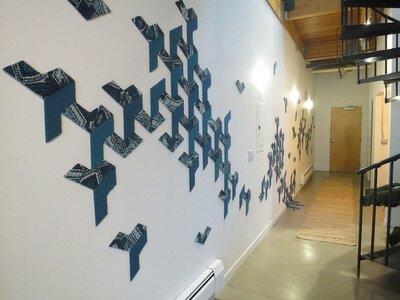 This project is part of my art residency with Leap Arts in Education. 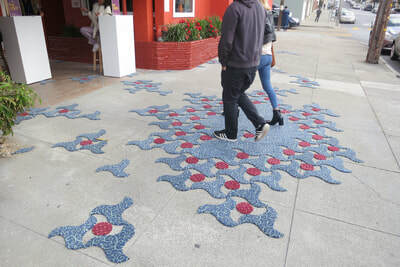 I was honored to be invited to create a site-specific installation for the entrance of stARTup Art Fair at Hotel del Sol. During three days, the Hotel gets transformed into a pop-up venue featuring independent artists, non-profit art organizations, art panels, etc. 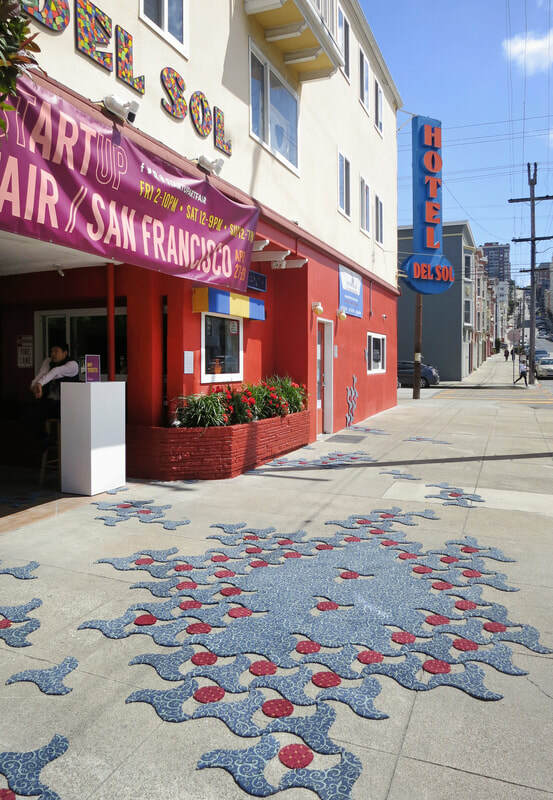 As part of Special Projects, I transformed the sidewalk and entryway of the hotel into an inviting environment, creating a path that leads the public from the street to the hotel courtyard. 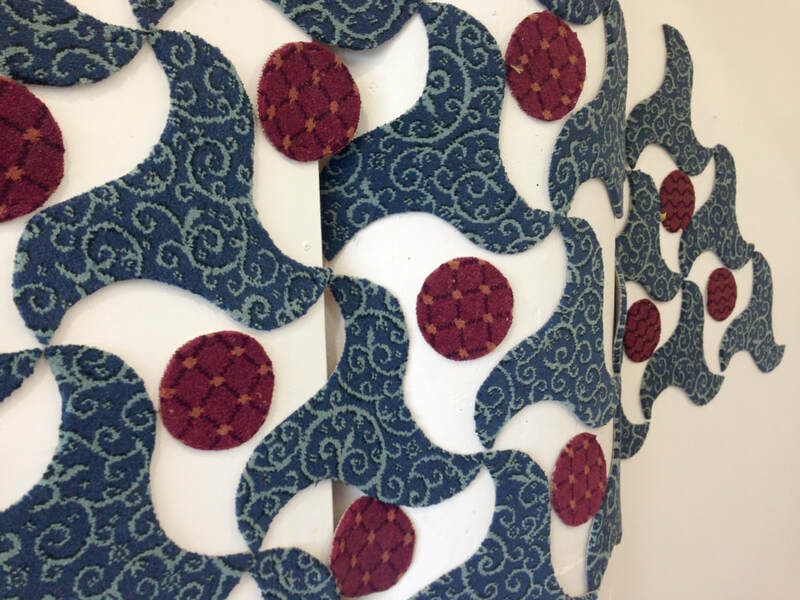 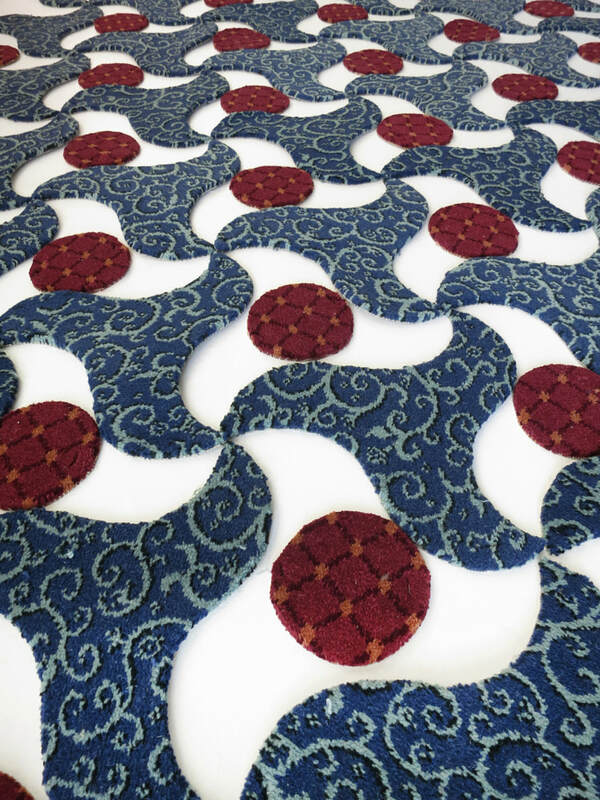 Using recycled hotel carpets I designed a repetitive pattern that extends from the floor to the wall evoking an arabesque motive. On it's fourth year, stARTup has become a destination event, attracting artists, art industry leaders, and art collectors from across the U.S. and beyond. Alhambra S.R.O. 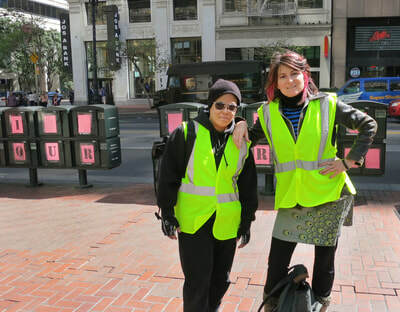 is a multidisciplinary art project that consists of a site-specific installation and a gastronomical experience drawn from a local immigrant community of the Tenderloin in San Francisco. 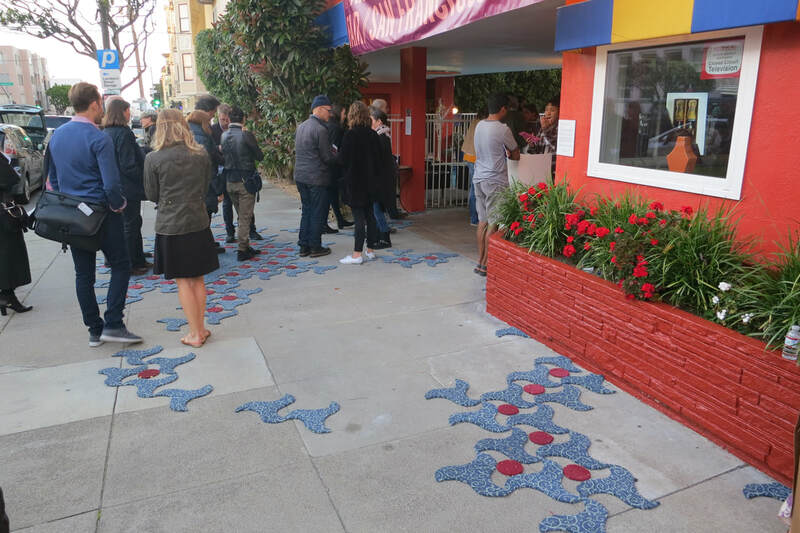 This project not only playfully engages with the architectural features of the gallery but also comments upon the cultural and social dynamics of this neighborhood. 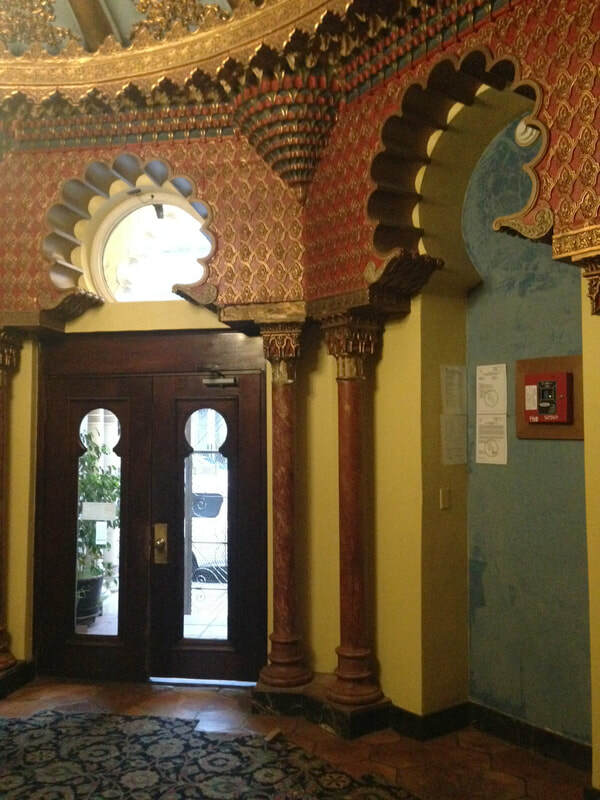 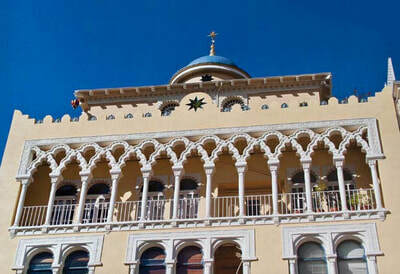 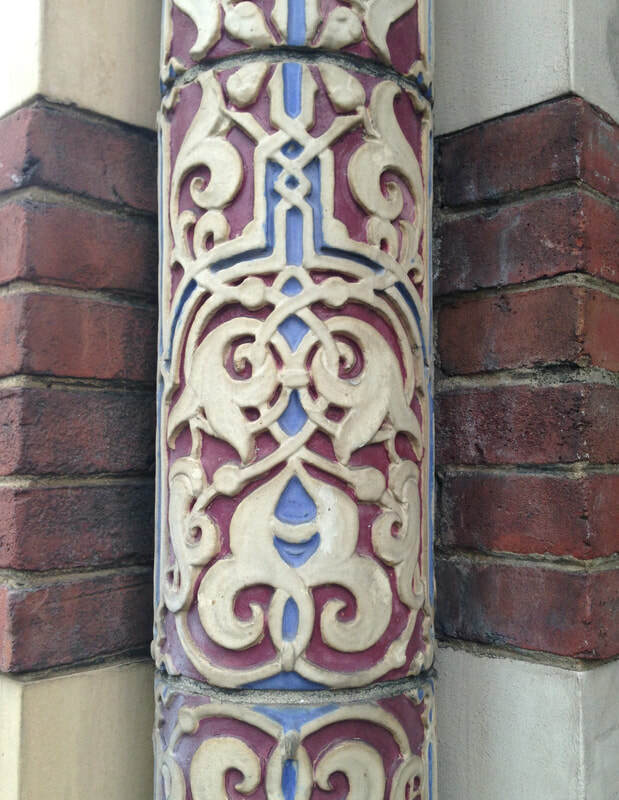 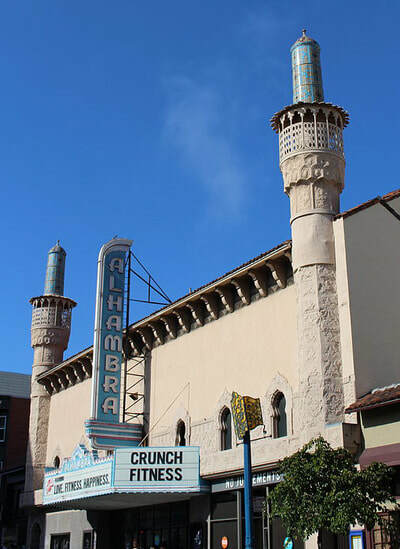 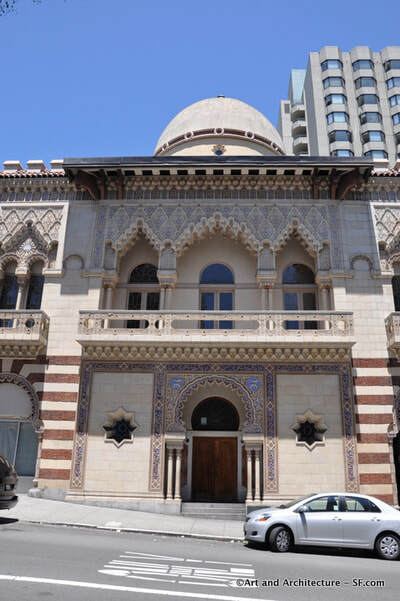 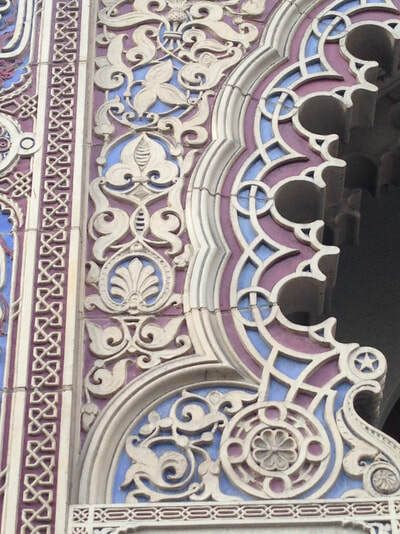 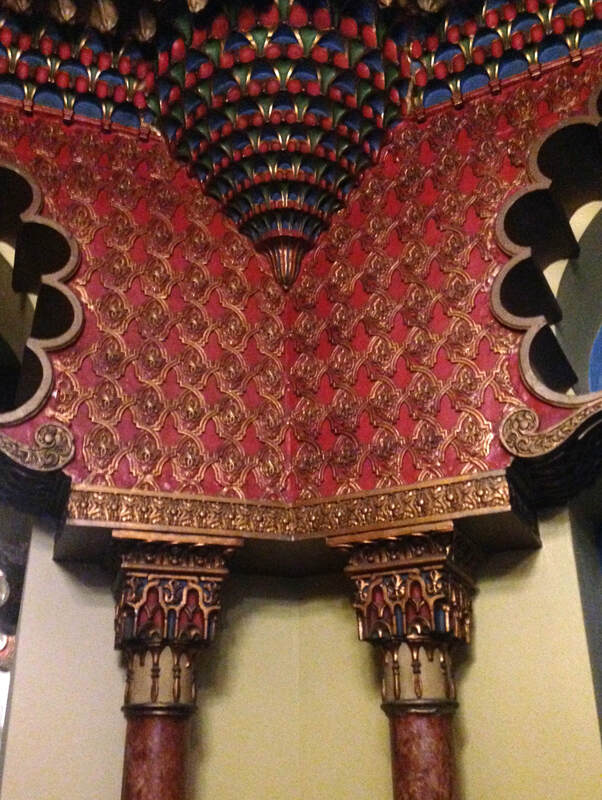 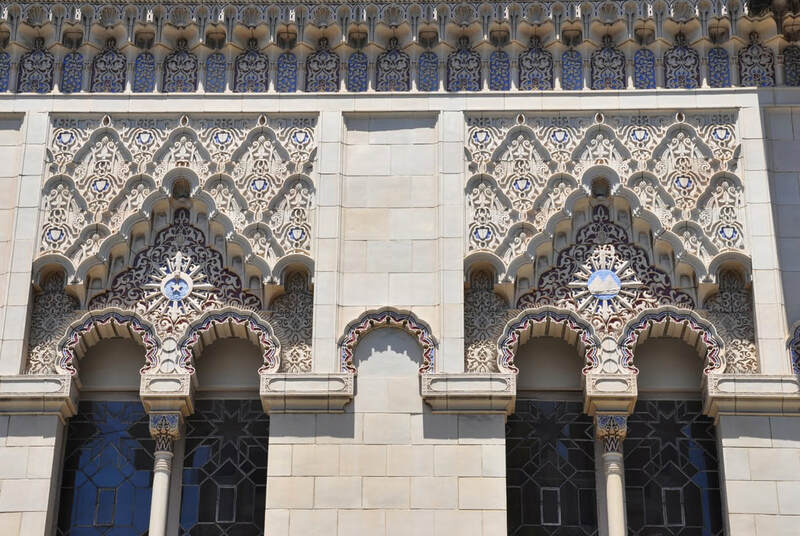 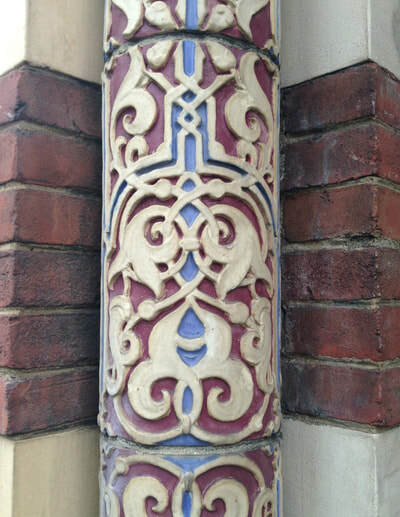 Inspired by the landmark “Alhambra Apartments” on Geary St, I call attention to the irony of the cultural appropriation of Arabic architecture in the early 20th century and the contemporary stigmatization of islamic people in what is perhaps the most culturally diverse neighborhood in San Francisco. 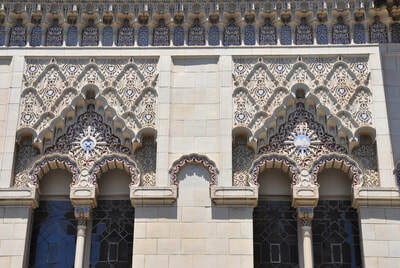 As a native Spaniard from Jerez de la Frontera, I am aware of the profound influences that Arabic culture left in Andalucia, the Alhambra of Granada being the most important example. 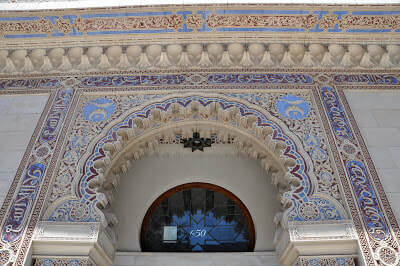 In fact, the name “De La Frontera" alludes to the border between the Christians and the Moorish Kingdom of Granada. 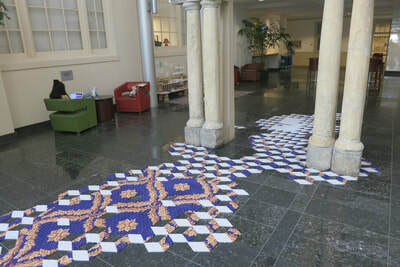 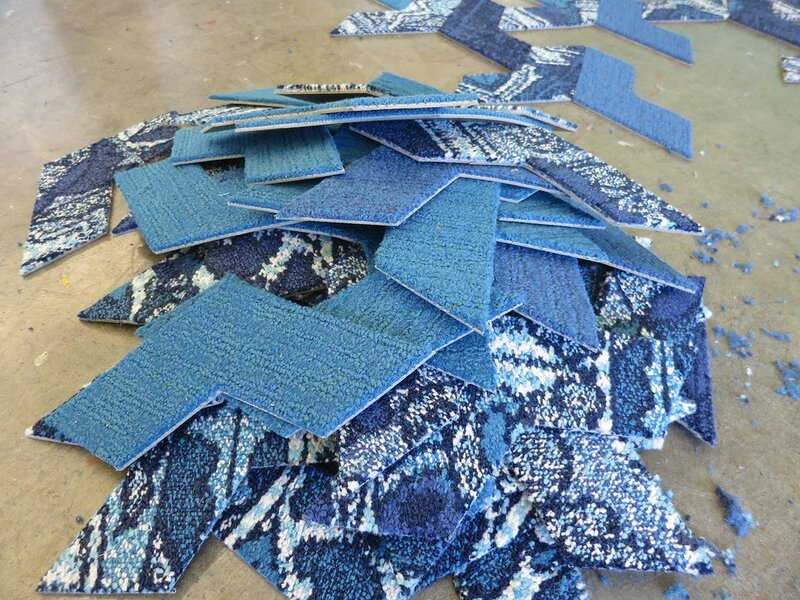 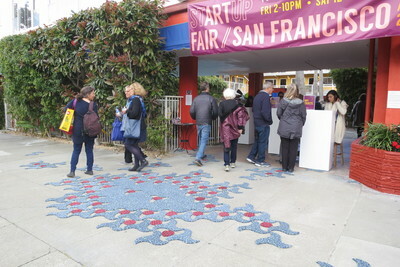 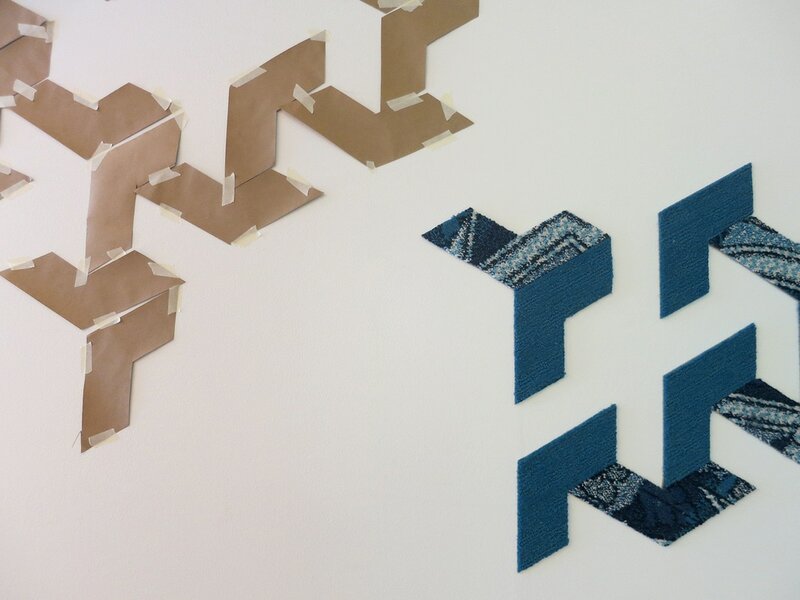 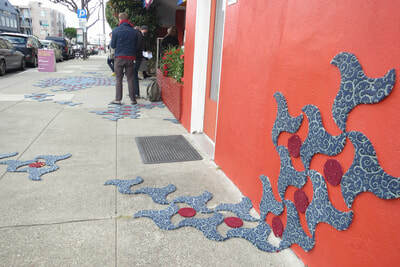 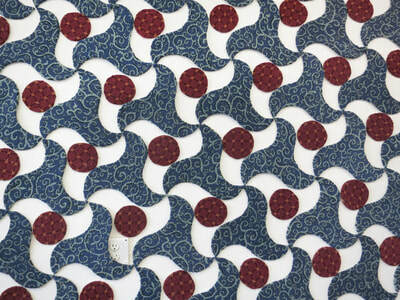 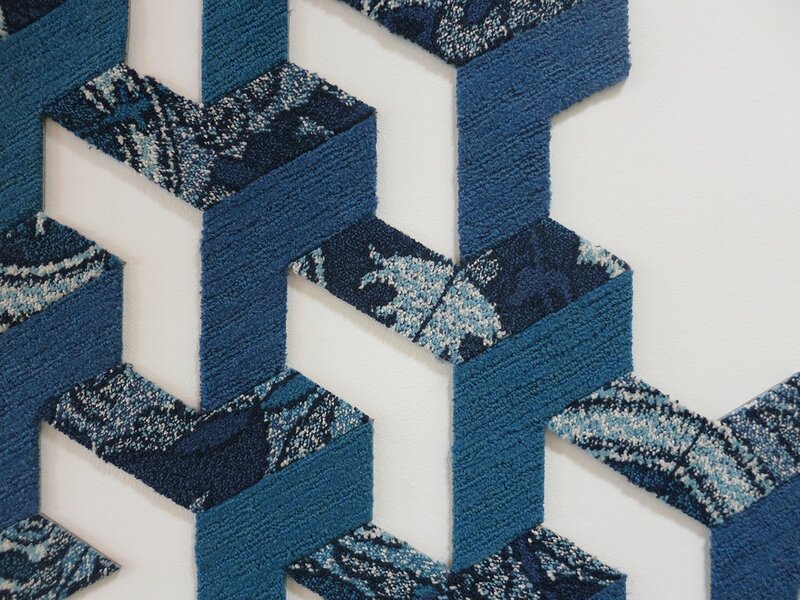 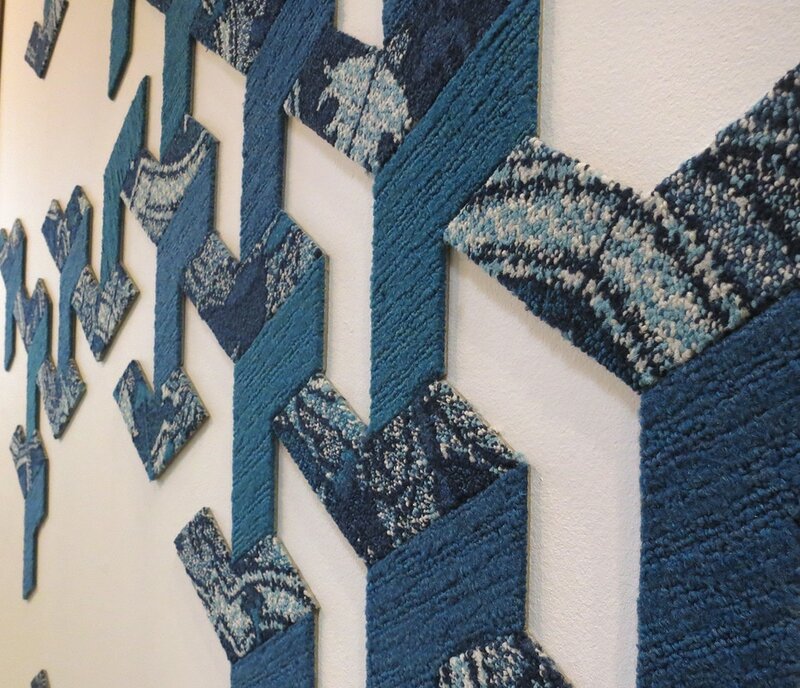 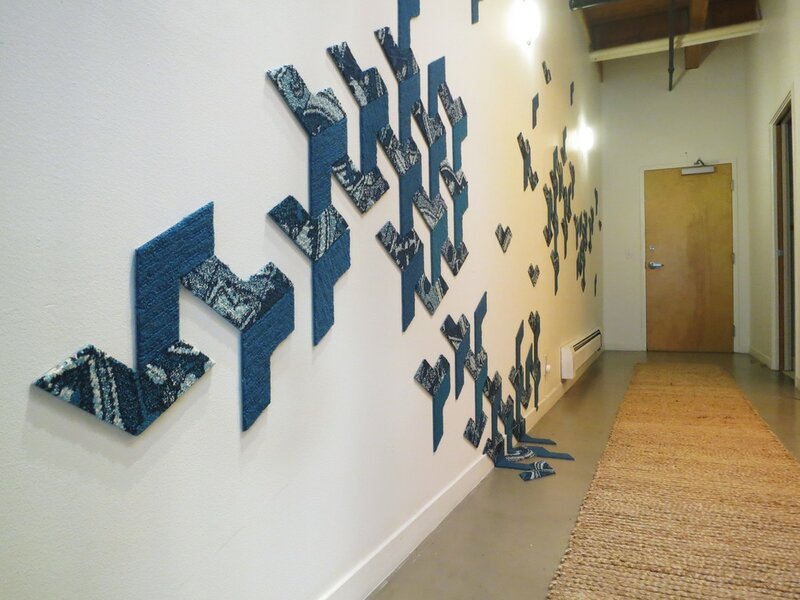 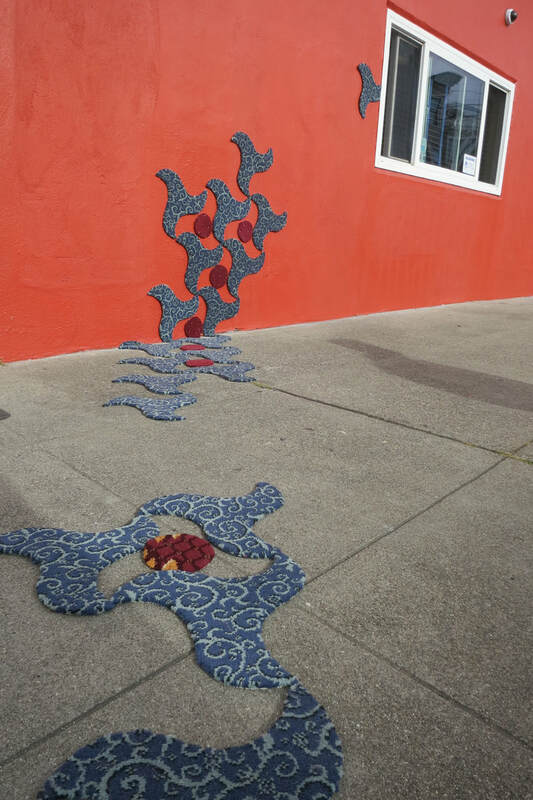 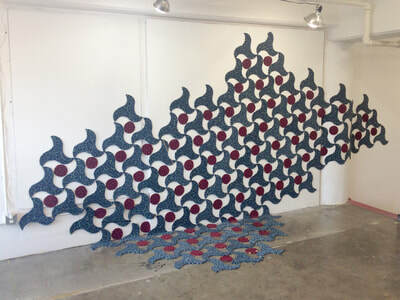 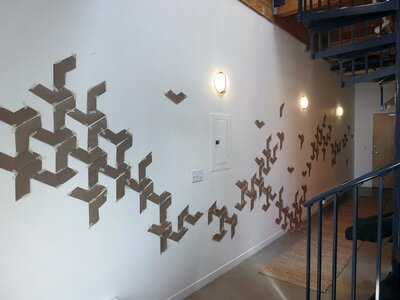 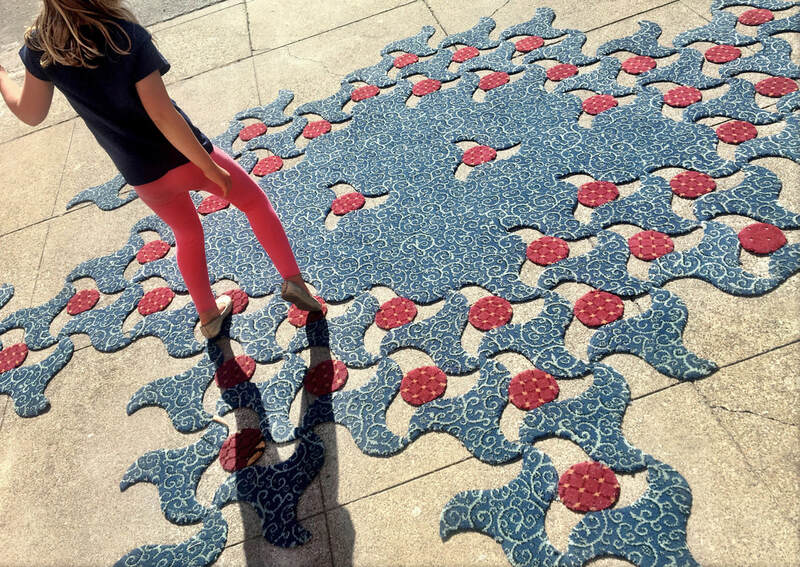 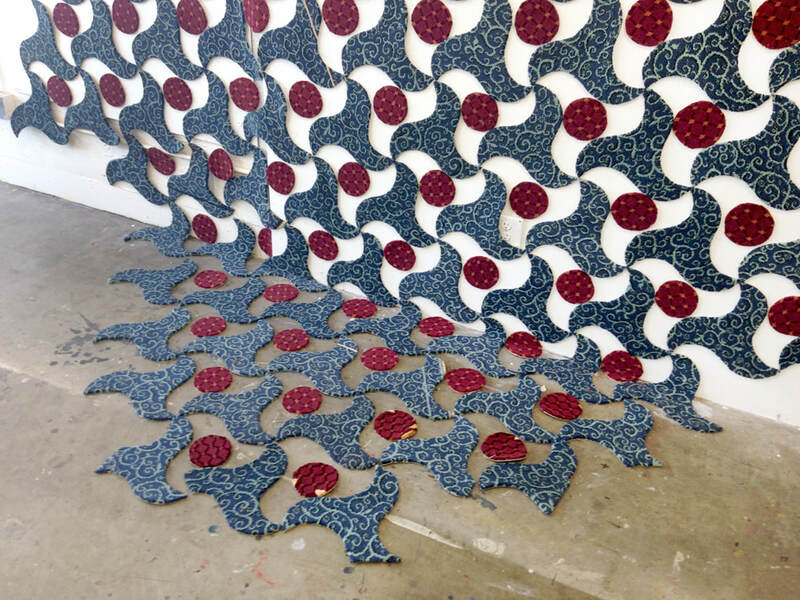 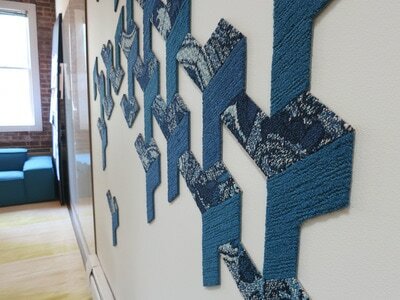 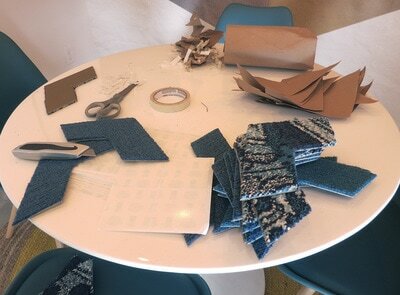 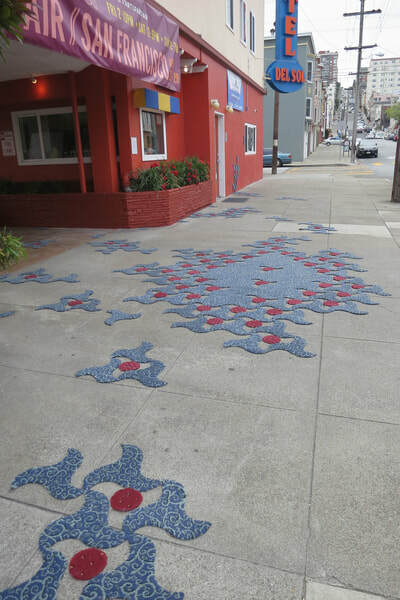 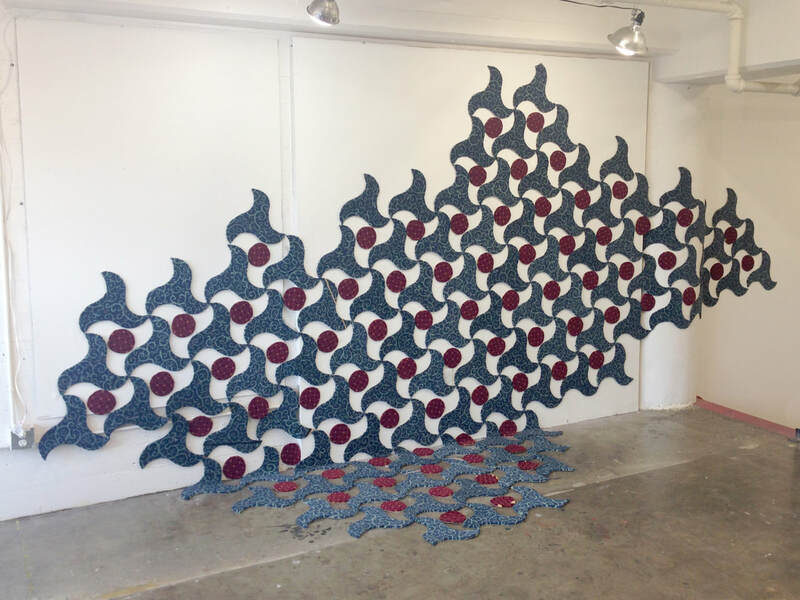 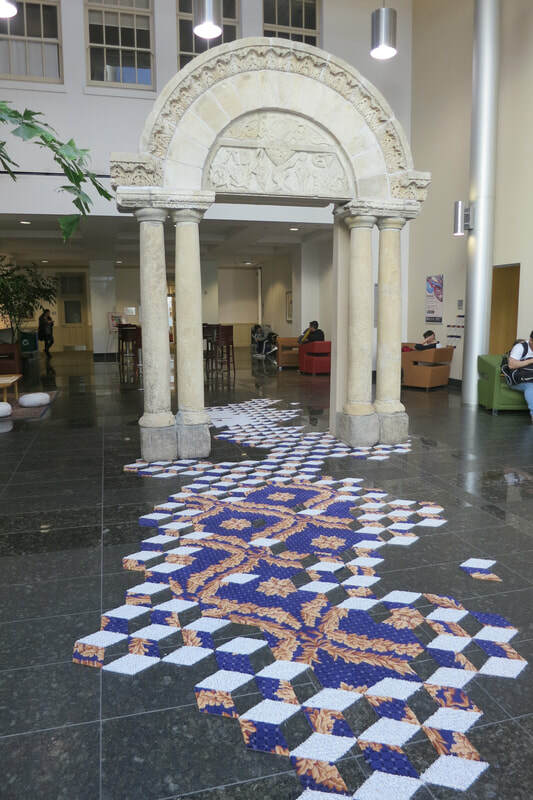 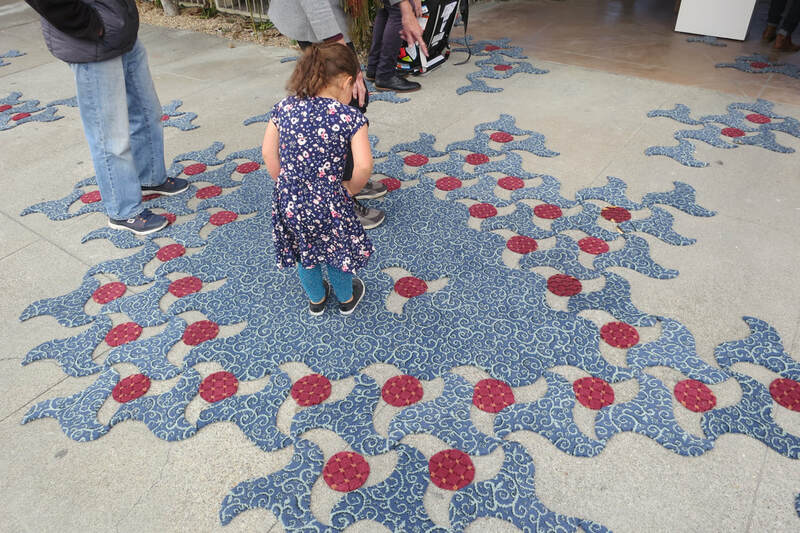 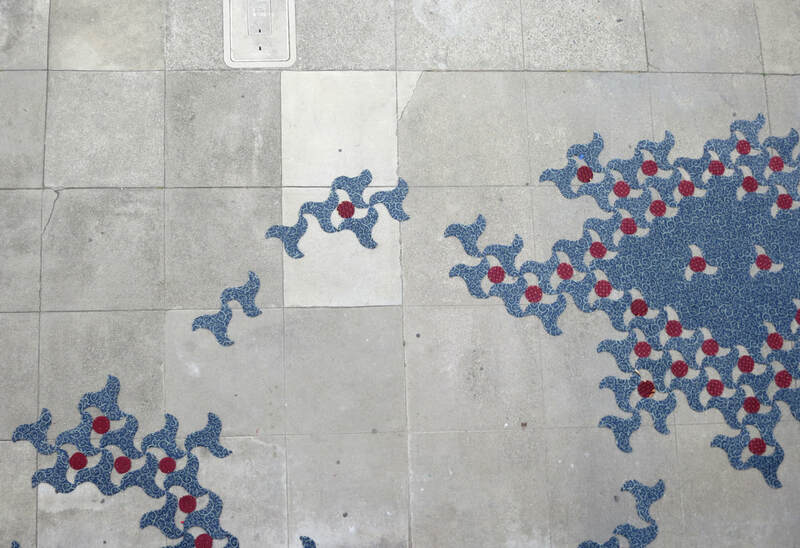 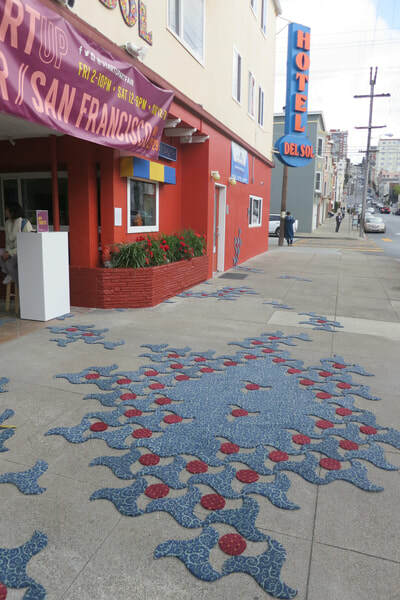 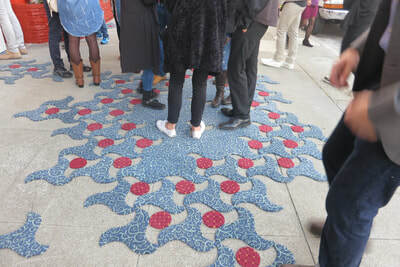 This Site-Specific installation consists of a geometric patten found in The Alhambra Palace in Granada, Spain, made of hand-cut pieces of recycled carpet from a hotel in the Tenderloin. 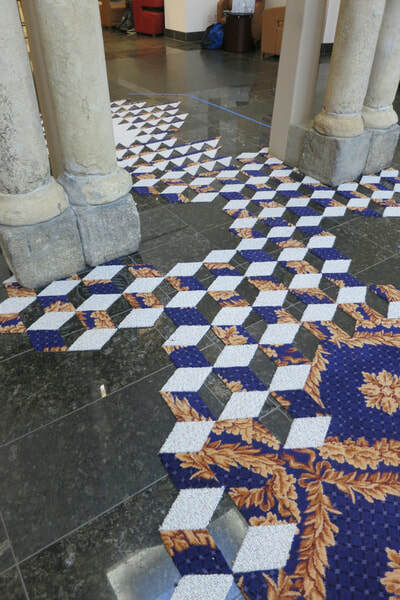 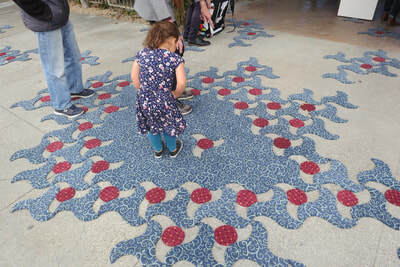 The pattern will be repeated through the gallery, including floors emphasizing the decorative style of Arabic tiles. 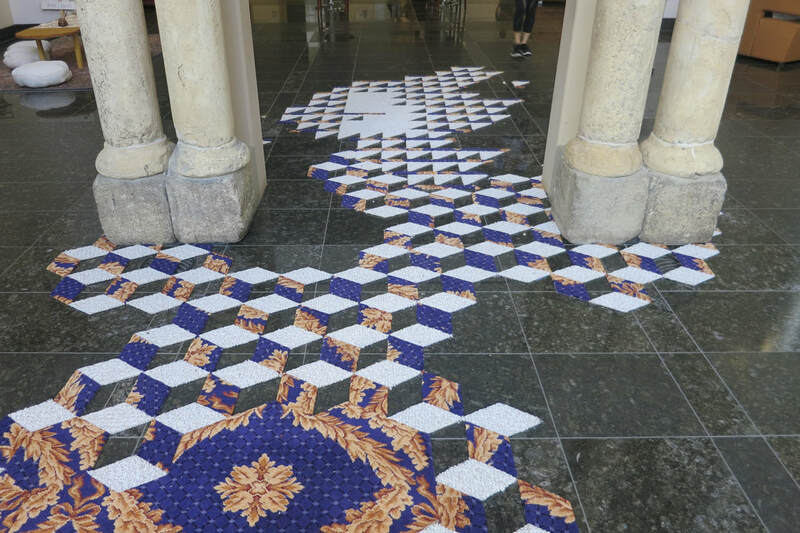 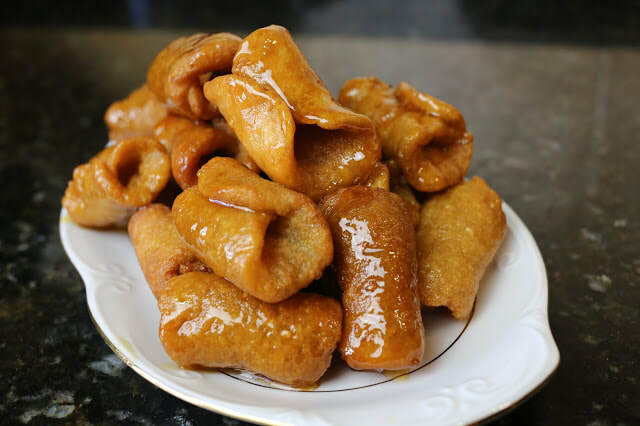 Parallel to the artwork, in collaboration with the local community and chef Tomas Marconi, I will create a pastry with influences from Yemeni cuisine and from the Arabic-Andalusi desserts of my home town Jerez de la Frontera. By transgressing the bounds of fine art and invoking gastronomy, we move from spectator to companion, literally one we share bread with. 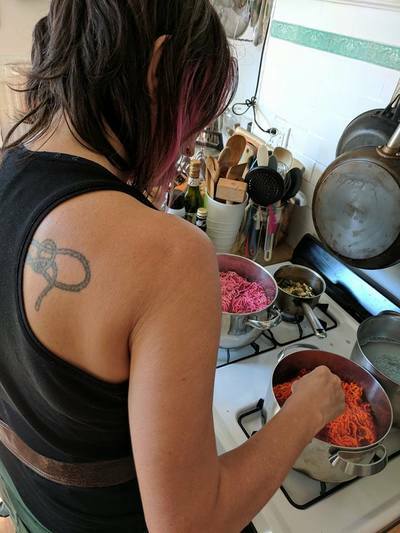 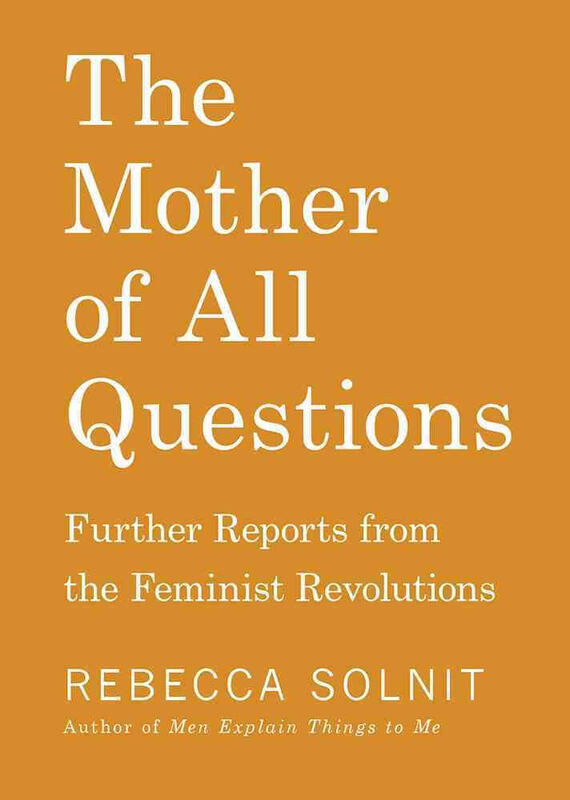 The food serves as a bridge from xenophobic stereotypes to conviviality. 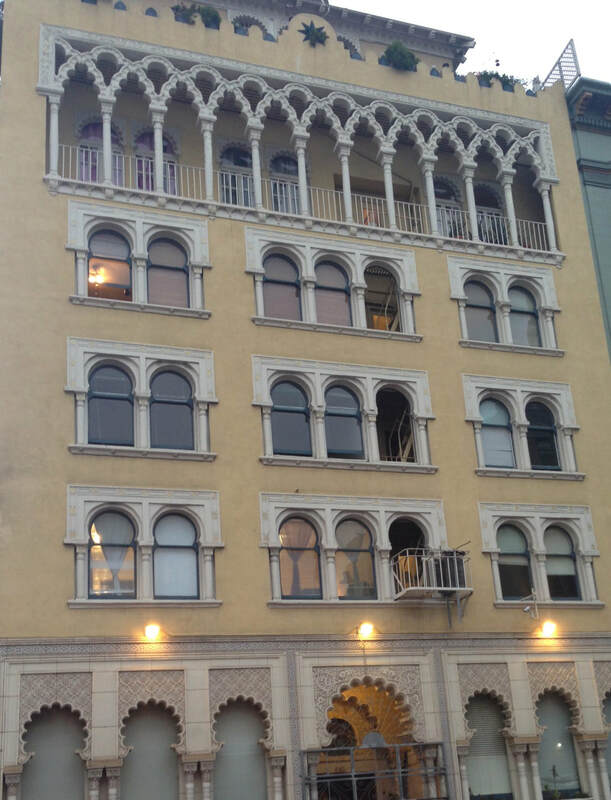 The installation also engages the storefront window of the gallery, that will have a postcard featuring the stereotypical Moorish buildings facades of the Tenderloin. 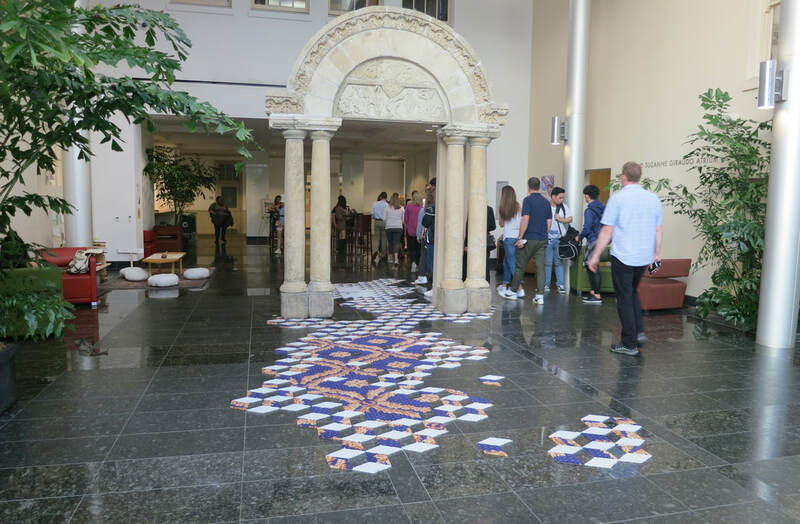 Guests are invited upon leaving the space of the installation to take a tour, guided by a copy of a hand-drawn map of buildings, restaurants, markets, and mosques—All features of a neighborhood, full of neighbors to meet as well. 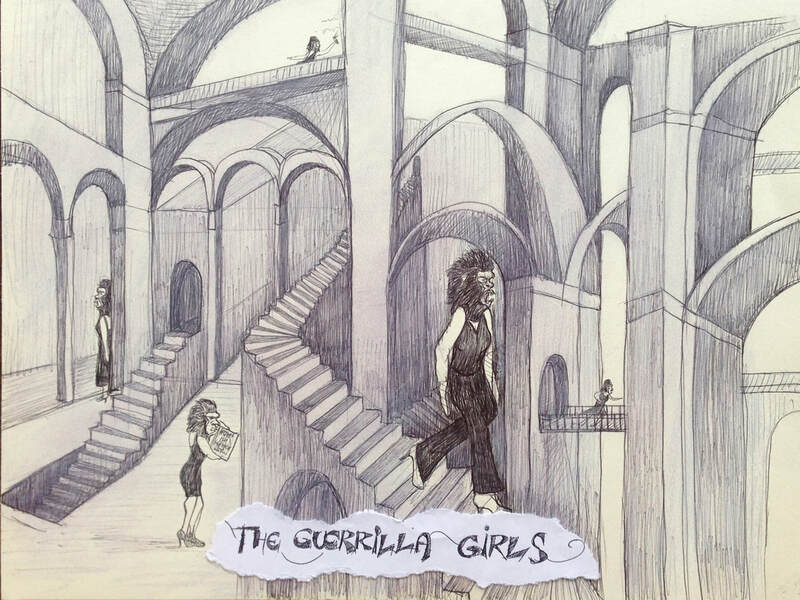 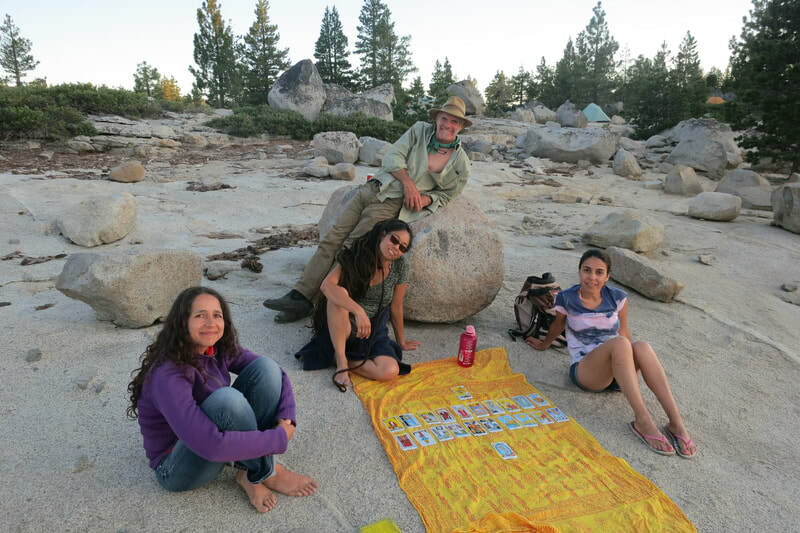 Daily Slots, the guerrilla art project in collaboration with Eliza Barrios, will be featured at the Luggage Store Gallery's next exhibition. 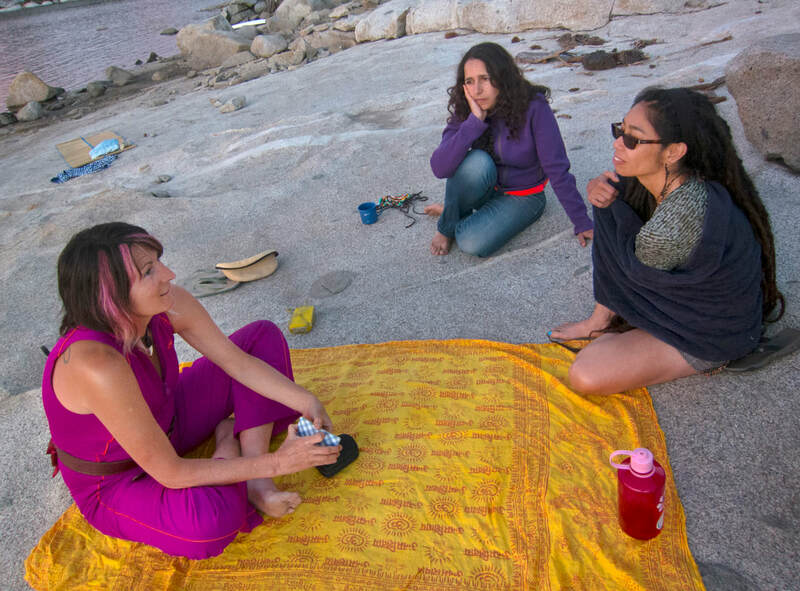 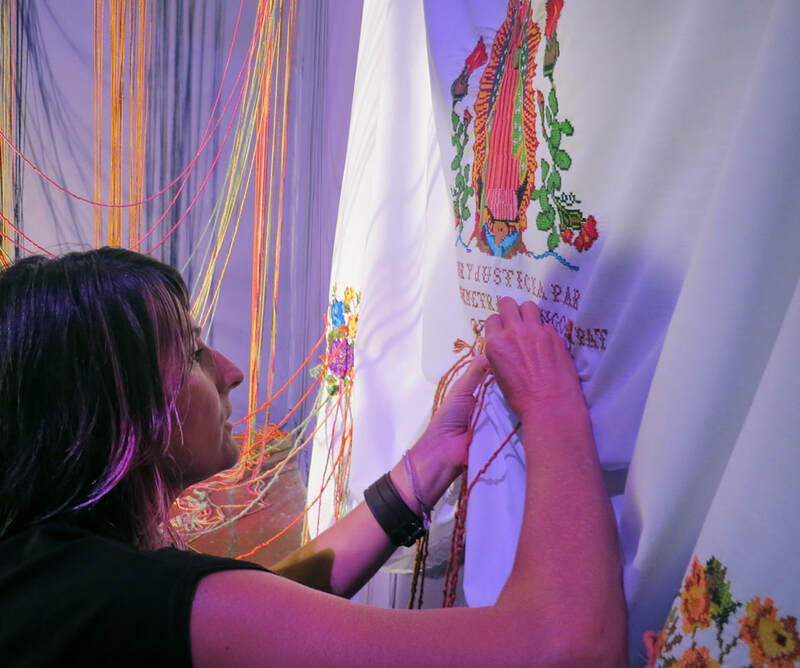 Addressing artist who have to navigate or break the law in order to express themselves, this upcoming show called ILLEGAL opens this coming Friday. 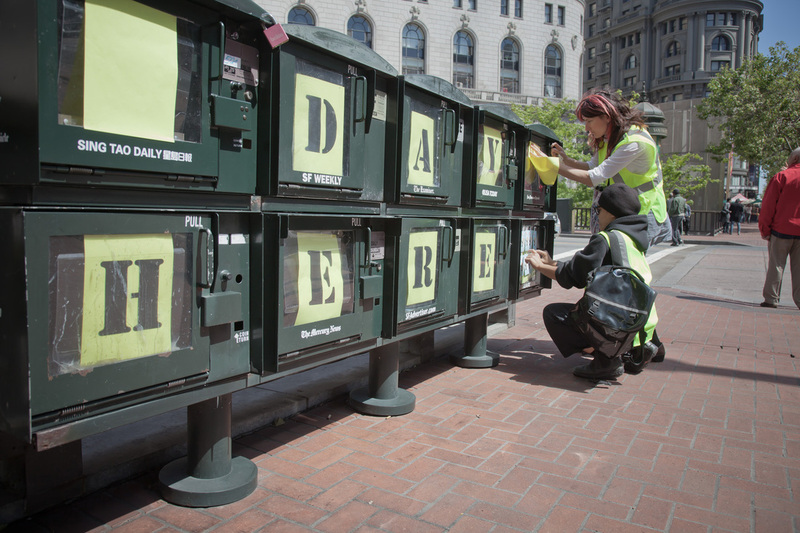 Daily Slots is an ongoing project that reflects the issues that affect our city. 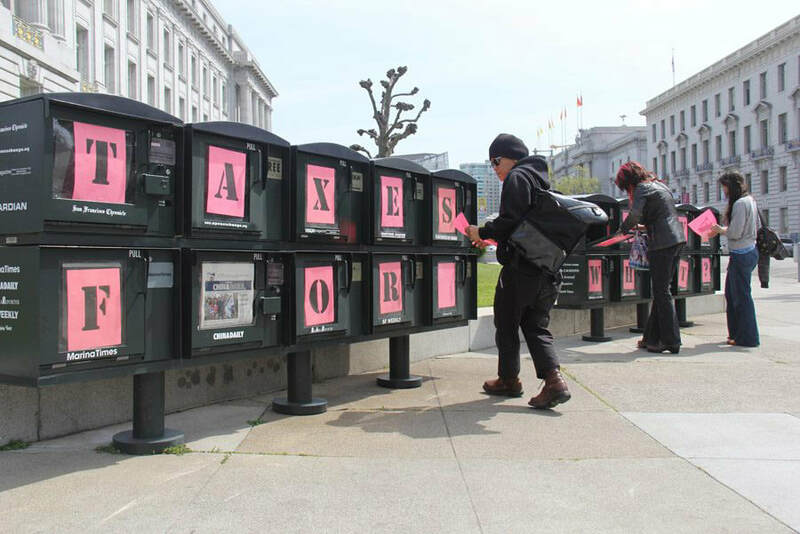 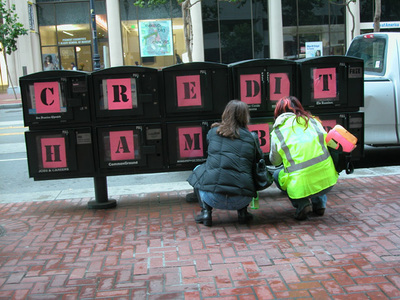 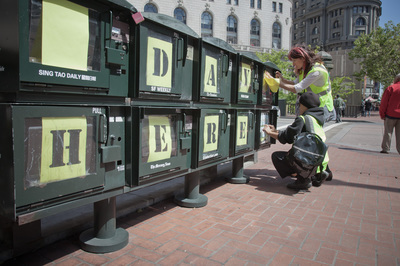 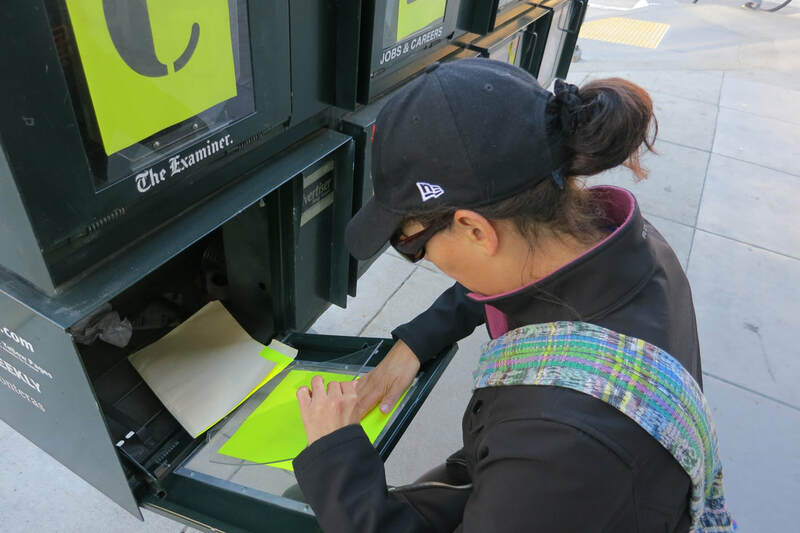 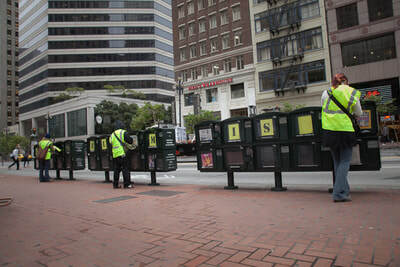 Using the newspaper stands located along Market, Montgomery Street and Civic Center Plaza as “vehicles to deliver information”, my collaborator and I send messages through the windows of these structures. Altering the visual landscape of the pedestrian/urban environment, the messages are a mixture of iconography and slogans that call attention to the economy, consumerism and un-sustainability of the capitalistic culture. 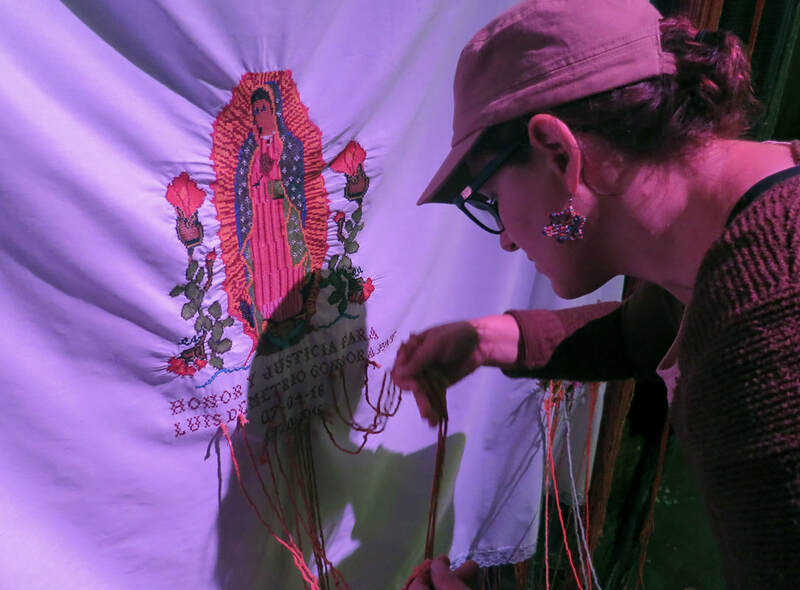 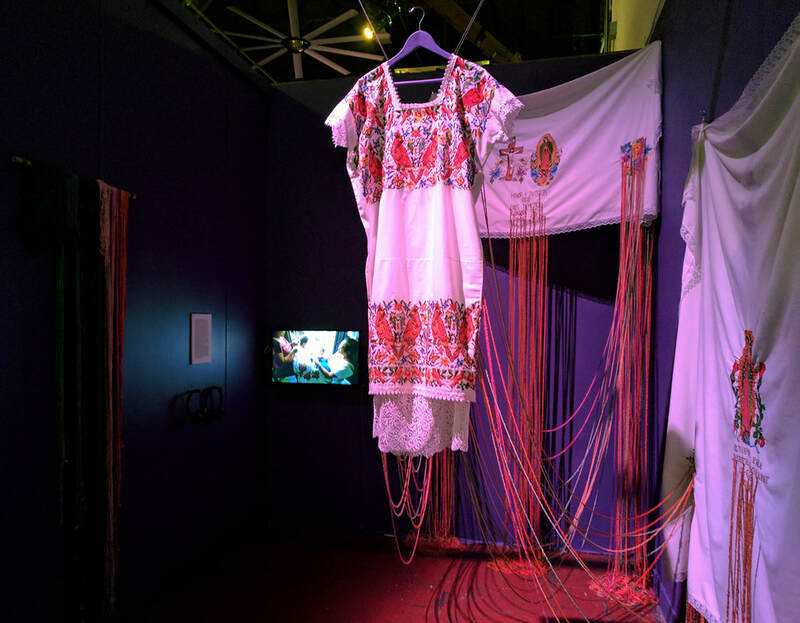 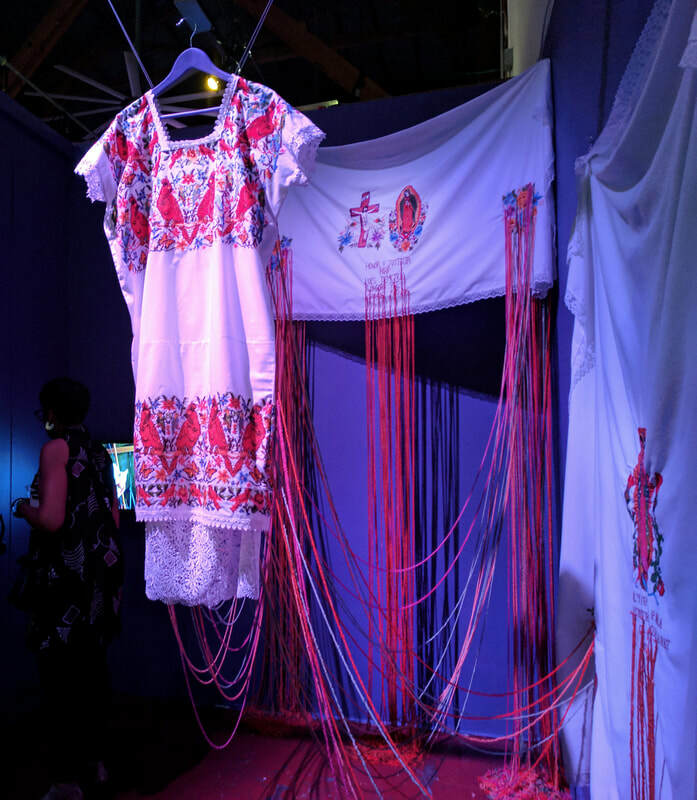 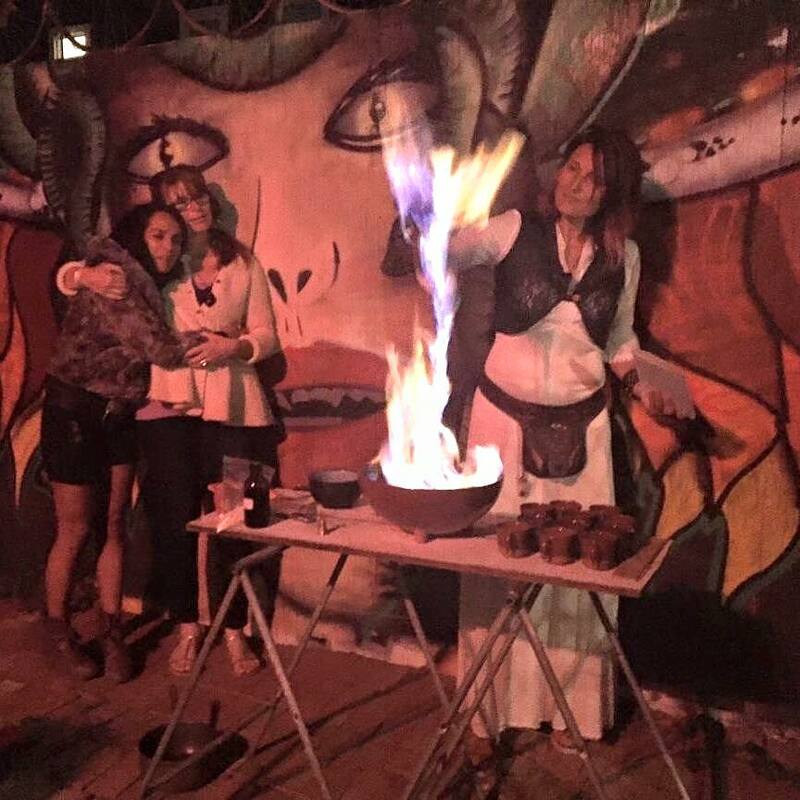 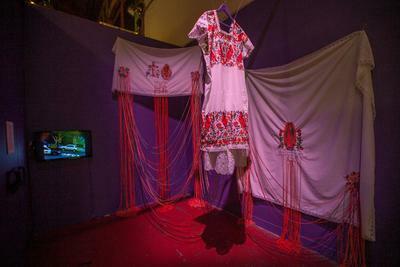 Tejiendo la Vida de un Maya" ("Threading the Life of a Mayan") is the title of an altar in collaboration with Adriana Camarena and Jose Gongora Pat honoring the life of his brother Luis, killed by the SFPD in 2016. Both Luis and Jose are from a small village in Yucatan, Mexico. Women in their village have carried for generations the tradition of working with embroidery and textiles. 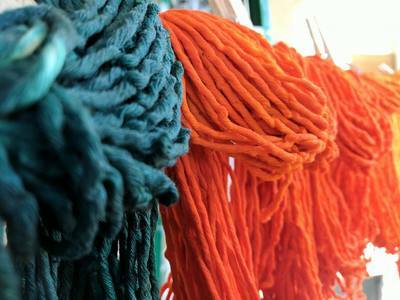 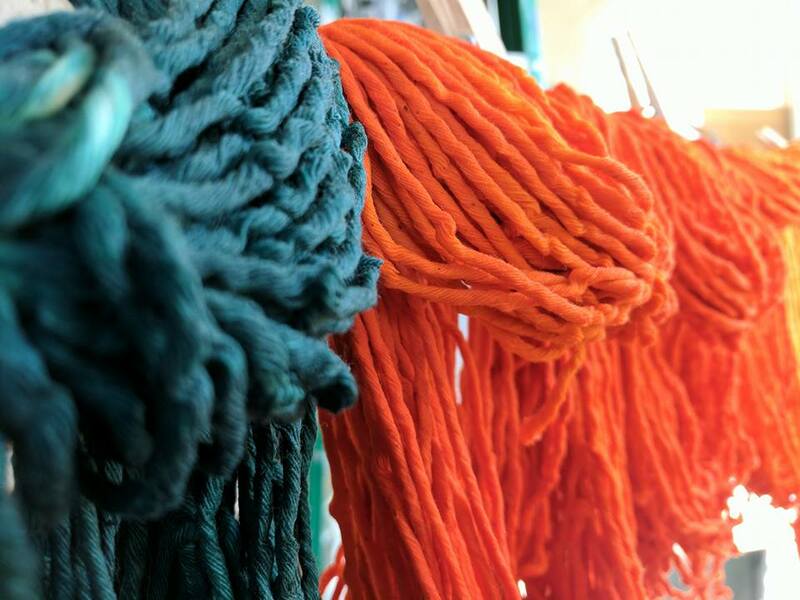 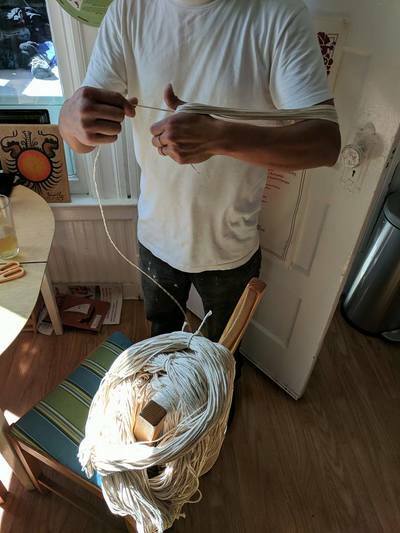 Using the dichotomy text/textile, both with same origin, we used hand dyed threads to weave Luis' story, from his origins in Yucatan to his life as an immigrant in San Francisco. 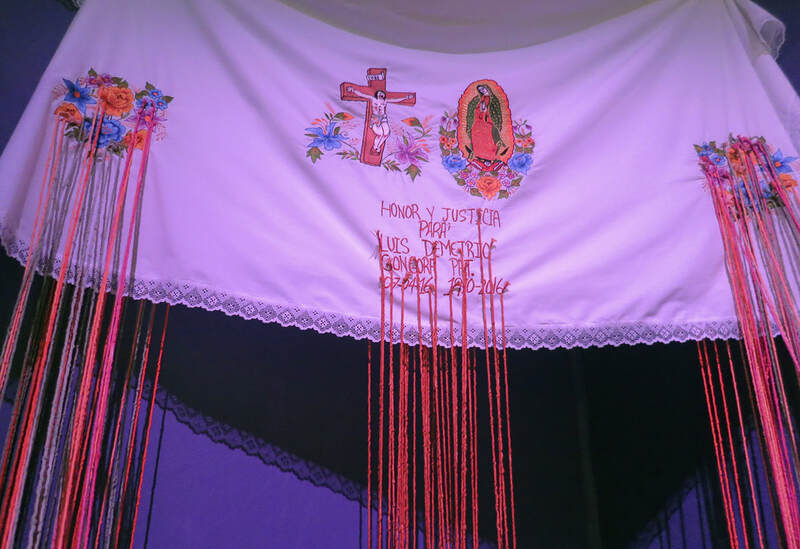 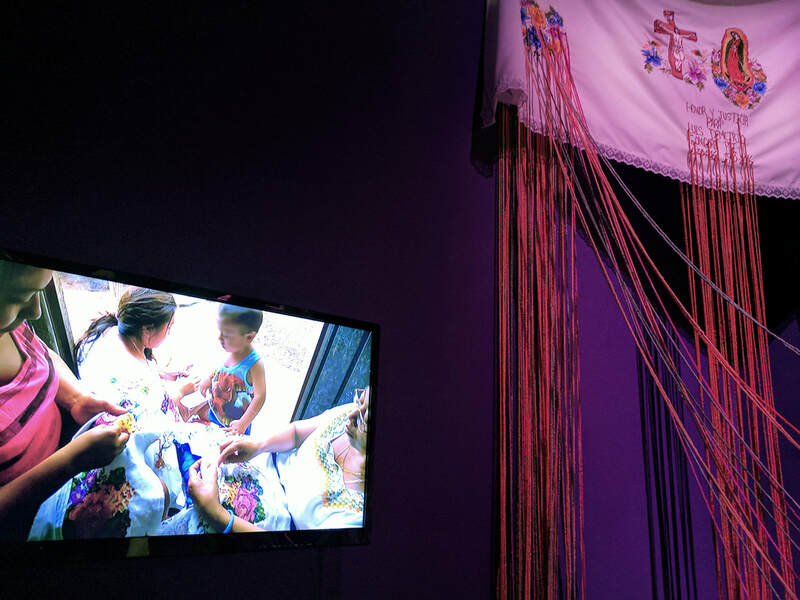 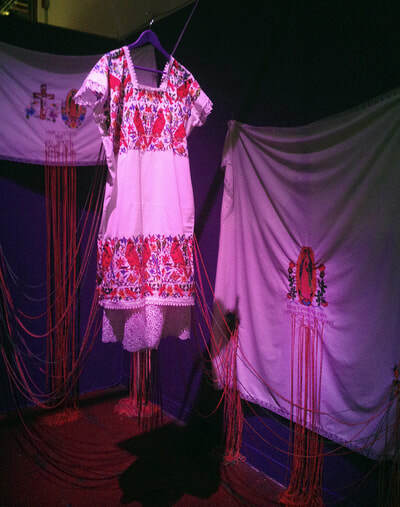 This non-traditional altar uses textile as the silent voice, as a metaphor for repressed or untold stories. 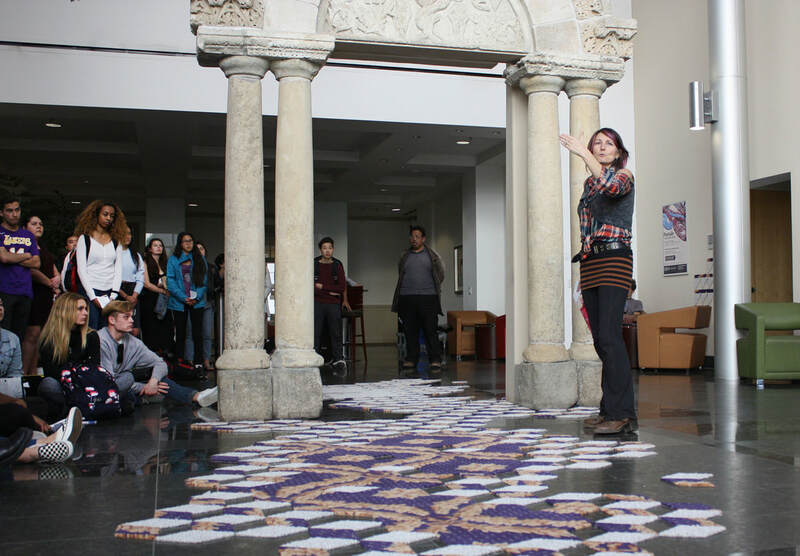 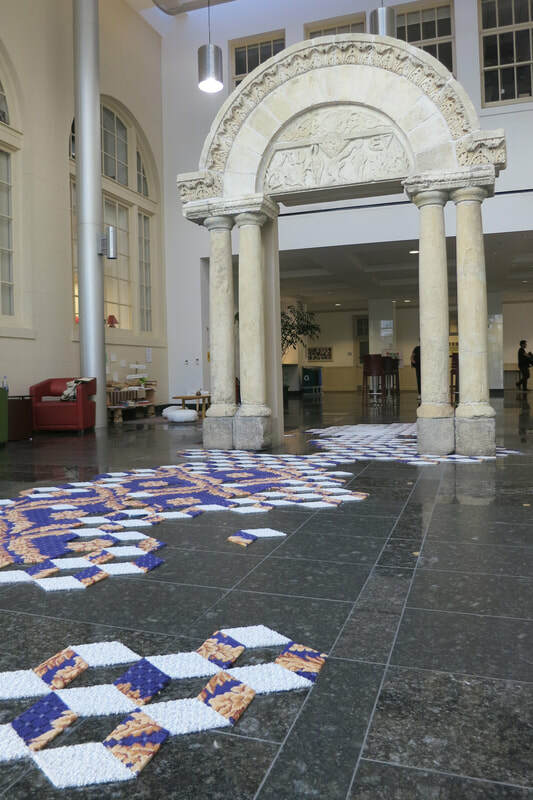 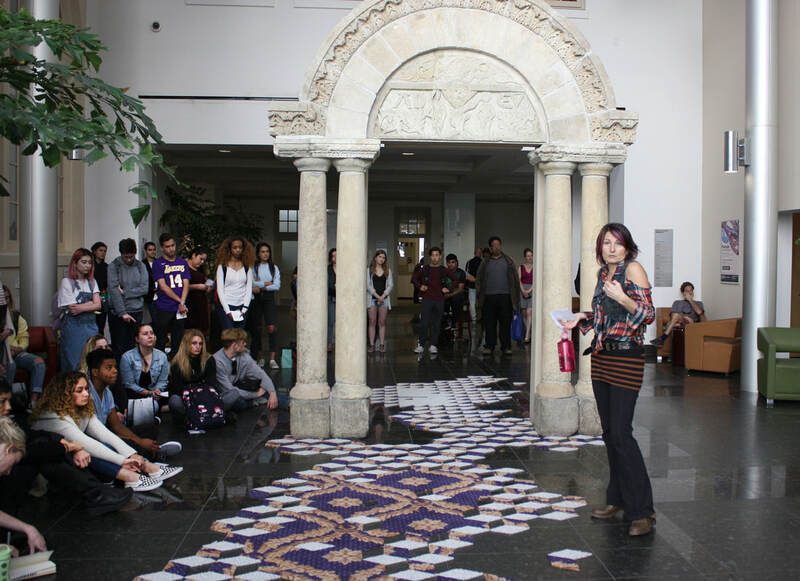 Carpet Diem is the title of a permanent carpet installation I created at the GO! office, downtown San Francisco. Its title points out to a new use of this recycled material. 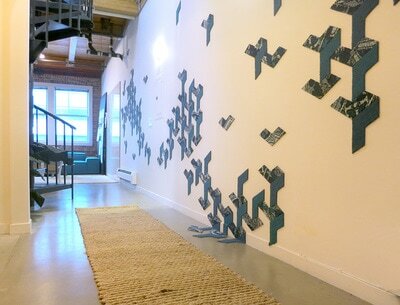 Over the last couple of weeks I hand cut 108 pieces of carpet that, following a geometric pattern, playfully engage with the almost 40' long office wall. 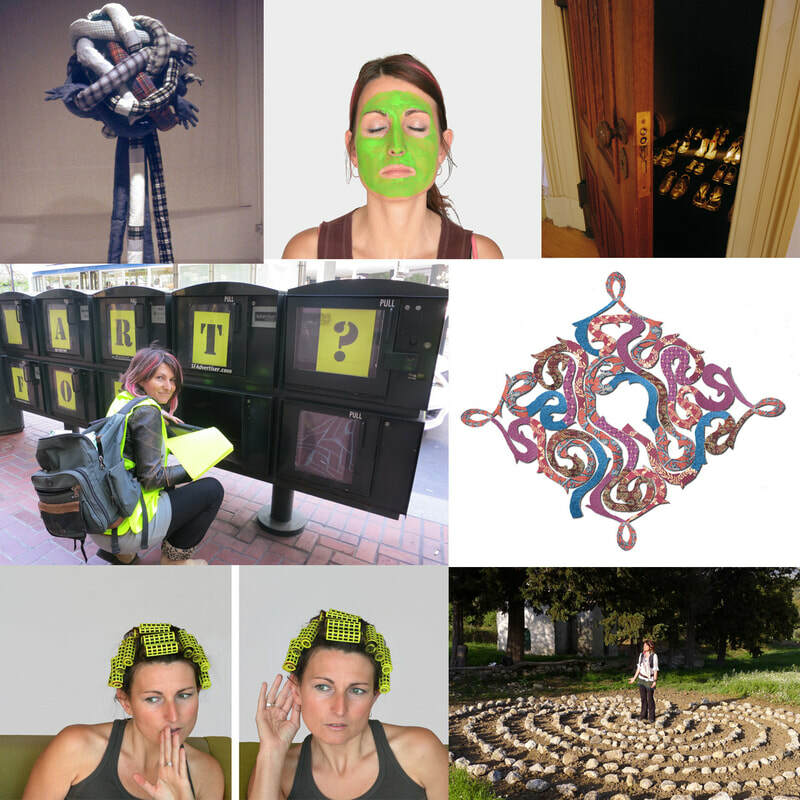 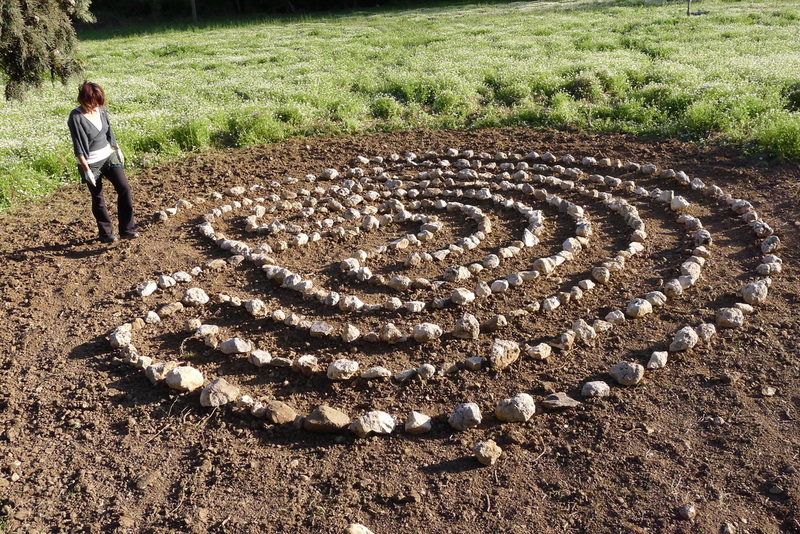 With my labyrinths I look for connection and interaction with the public, inviting them to wander along an alternative journey to the sometimes imposed urban layout. 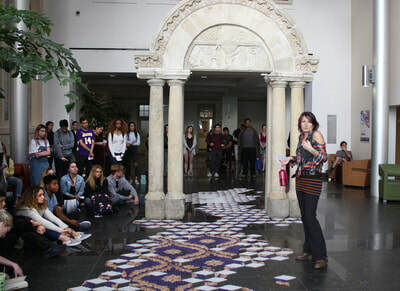 The same as the labyrinth proposes a new sacred territory for meditation and awareness, the geometric pattern of this carpet installation offer the public a powerful meditation tool. Geometric patterns, labyrinths or mandalas have taken me to travel around the world to places where I've witnessed the connection between these intricate constructions and ancient magical rituals. 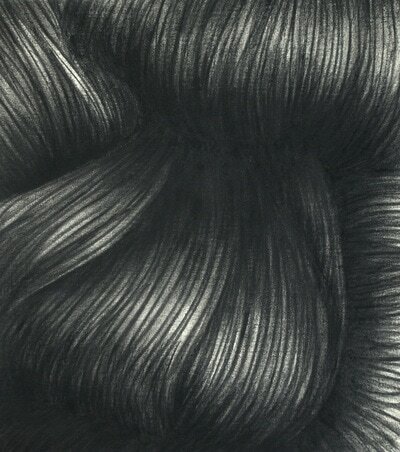 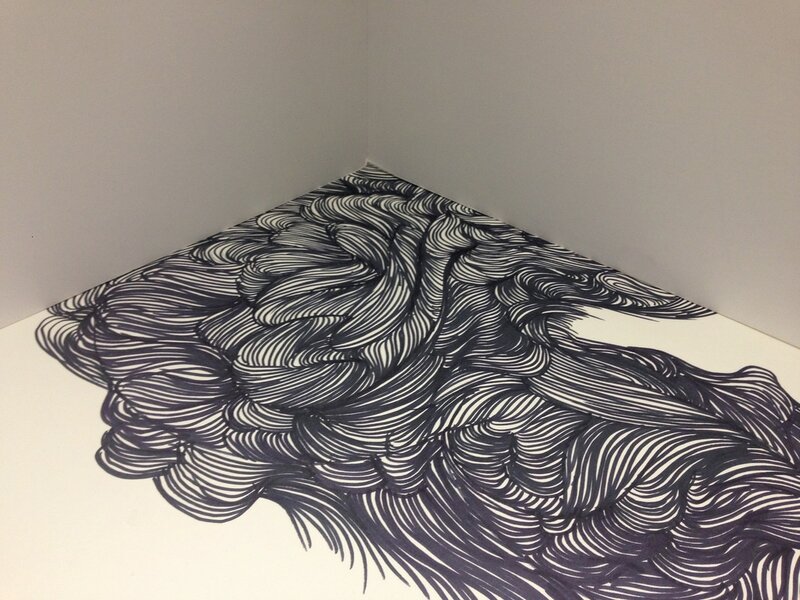 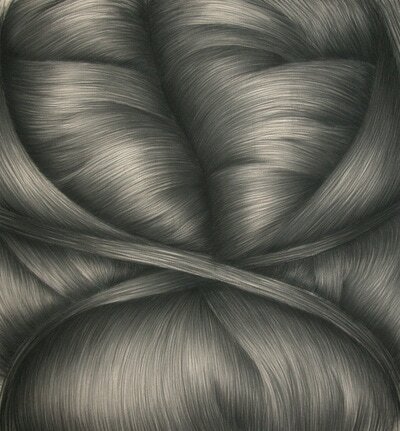 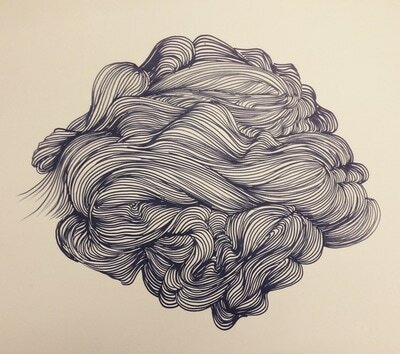 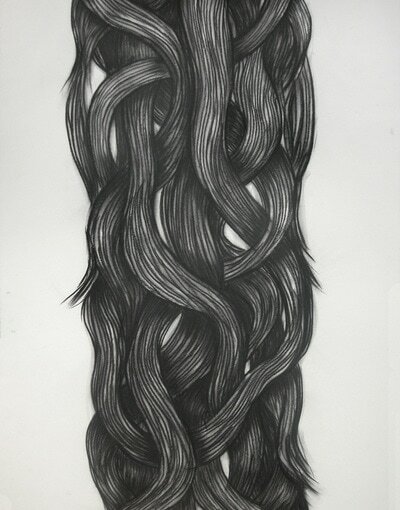 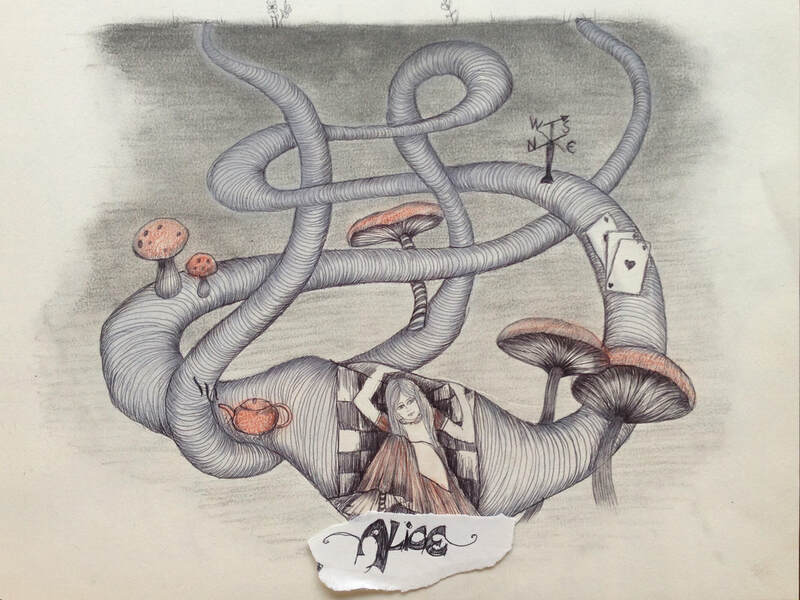 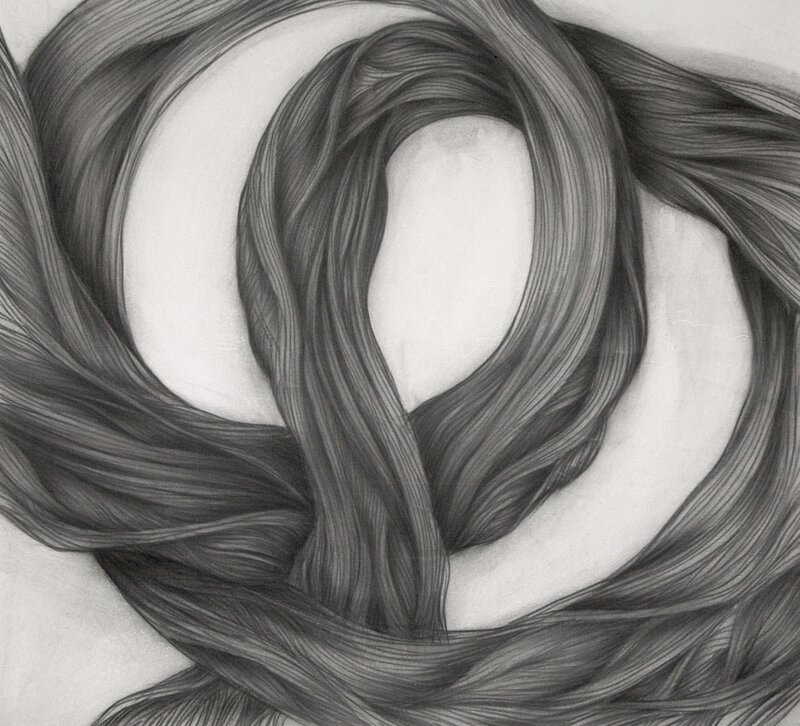 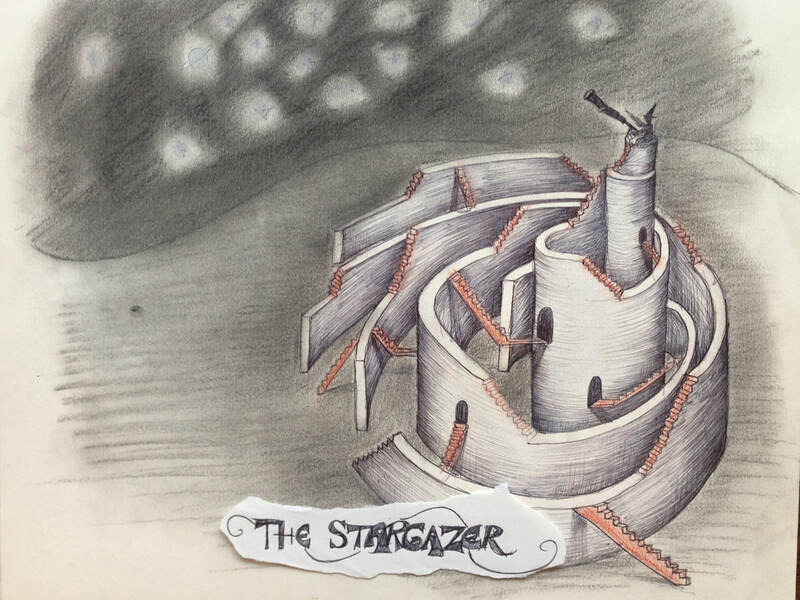 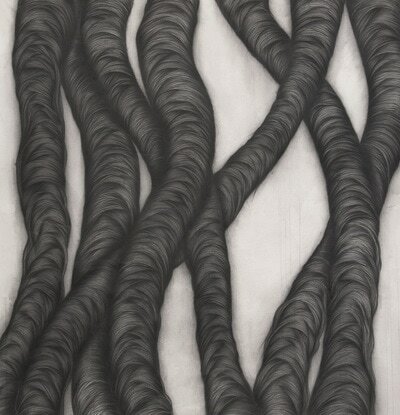 ​I see drawing as a form of connection with the space around me. 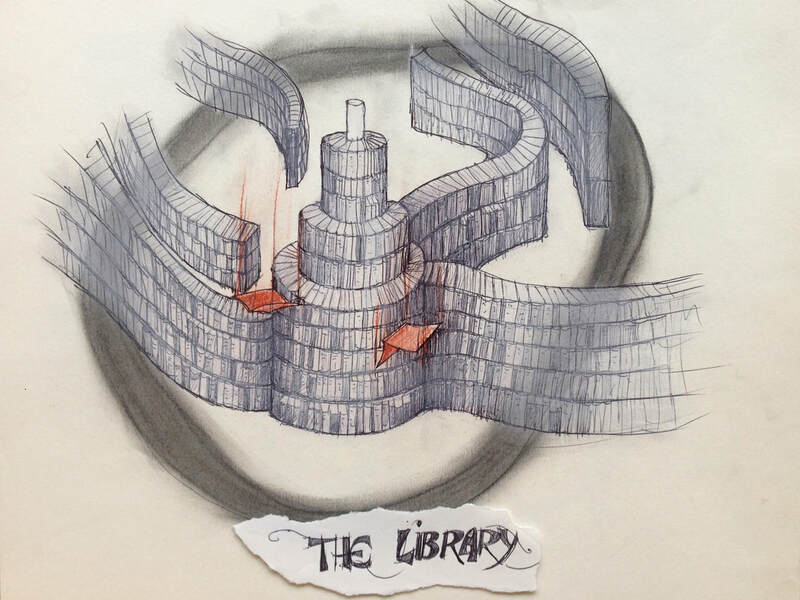 When drawing and architecture coexist there’s no separation between the maker, the object and the viewer; between you and me. 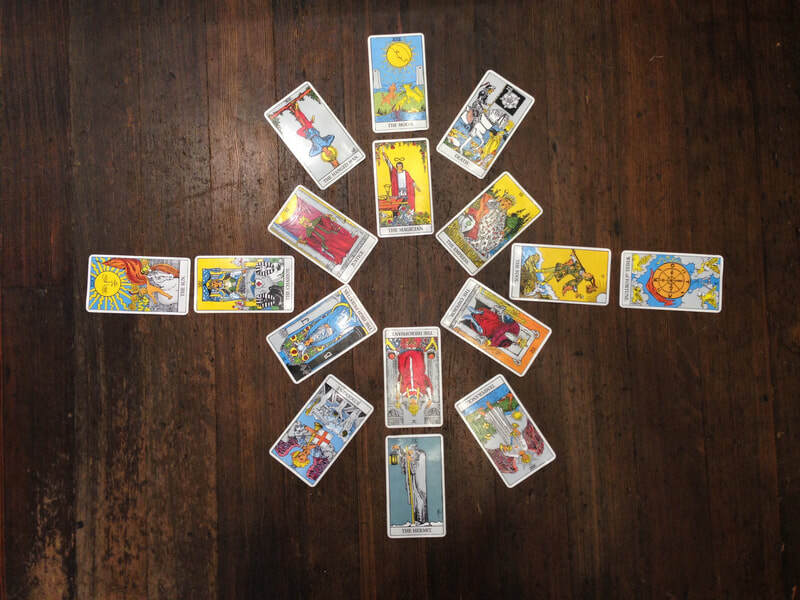 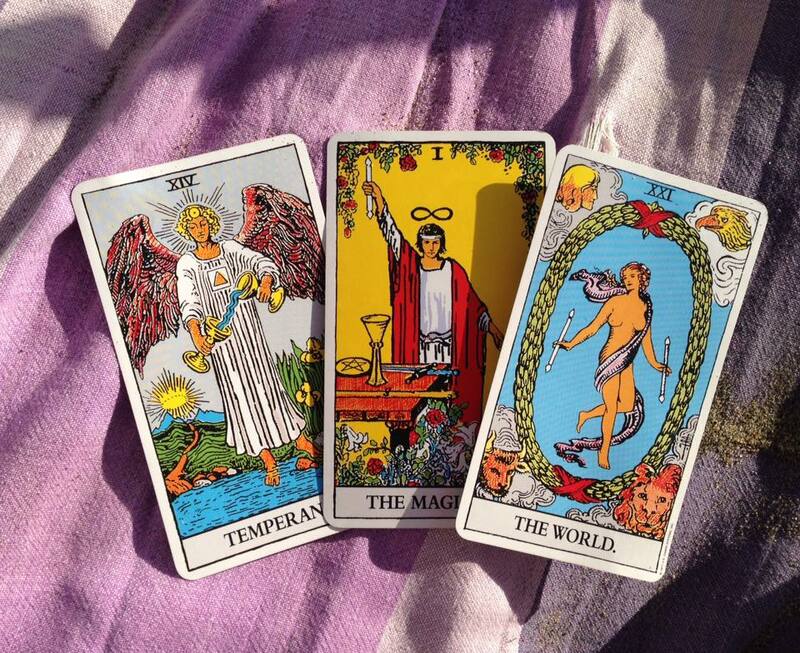 When this integration happens I see the world as an extension of who I am. 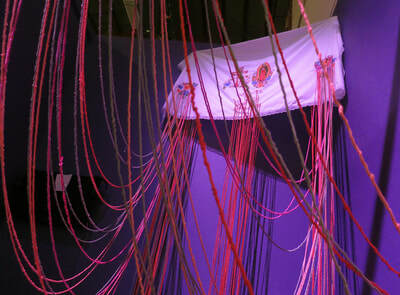 Cavemen lived a fully shamanic experience of art and space, projecting onto the cave walls their own psyche. 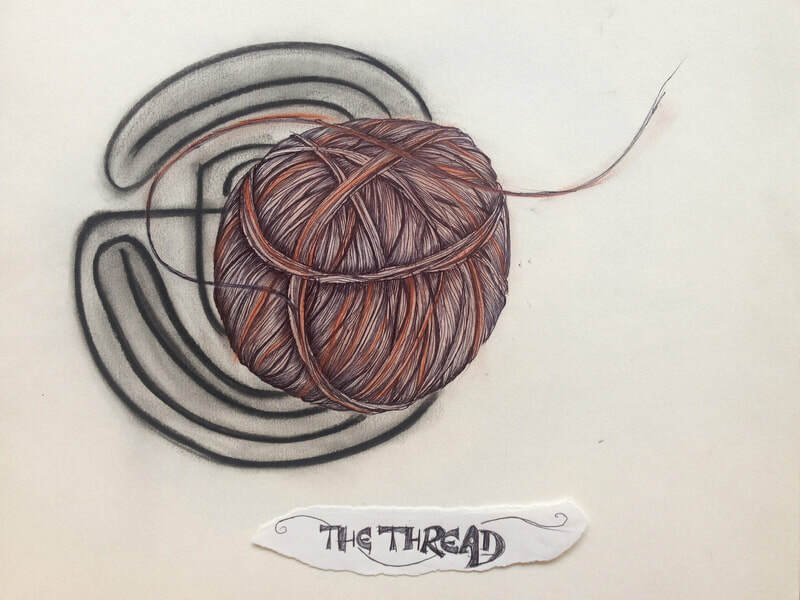 Drawing repetitive lines allows me to enter my subconscious mind and, like with Ariadne’s Thread, retrieve my most hidden secrets and bring them back to light.This is the game of life, a sutil thread that helps us to find our center in the labyrinths of our consciousness.